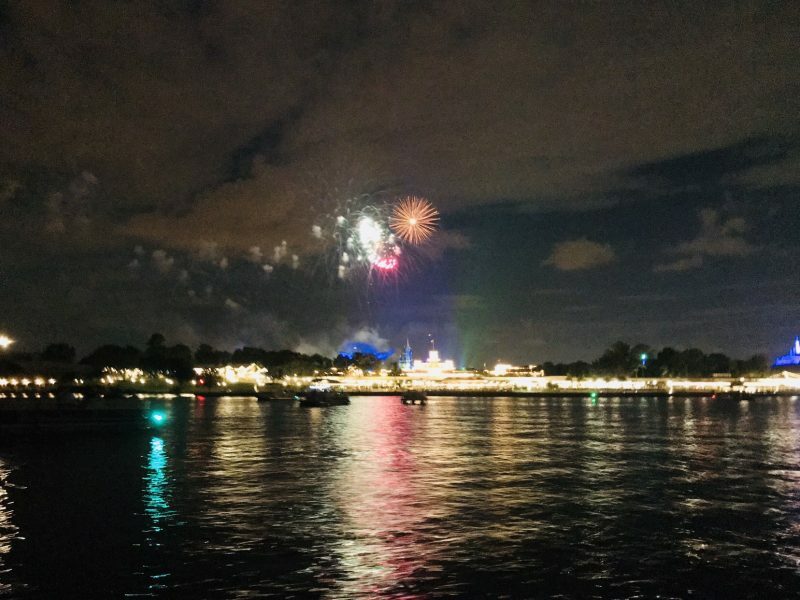 Home Tags Posts tagged with "magic kingdom"
This Disney World fireworks cruise is one extra magic opportunity you won’t want to miss while on your Disney World vacation! You know that Disney picture we’ve all seen, the magical commercial with fireworks behind Magic Kingdom’s train station, Cinderella’s castle popping up in the background and the monorail perfectly traveling in front of it all?? The Disney vacation commercial that makes us say “I want that” vacation experience? 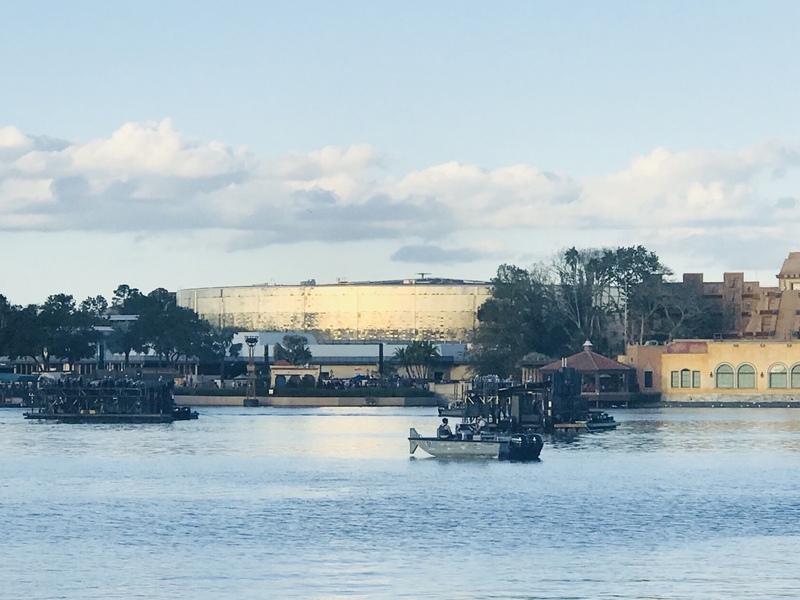 I’m here to tell you HOW to have that tv commercial like experience at Walt Disney world. I try so many things at Disney and the majority of them I really enjoy. They’re all fun! And nearly all of them give me that pinch me moment of “is this real life? How did I get lucky enough to call Disney my weekly playground? But this one experience tops so many of the other Disney World experiences I’ve had! It’s one you don’t want to miss. If you’re looking for extra magic… this is the one! You must watch Happily Ever After, Magic Kingdom fireworks show, from a boat on Seven Seas Lagoon. And no, not any boat will do. Hopping on the ferry or other boat transportation isn’t what I’m talking about! 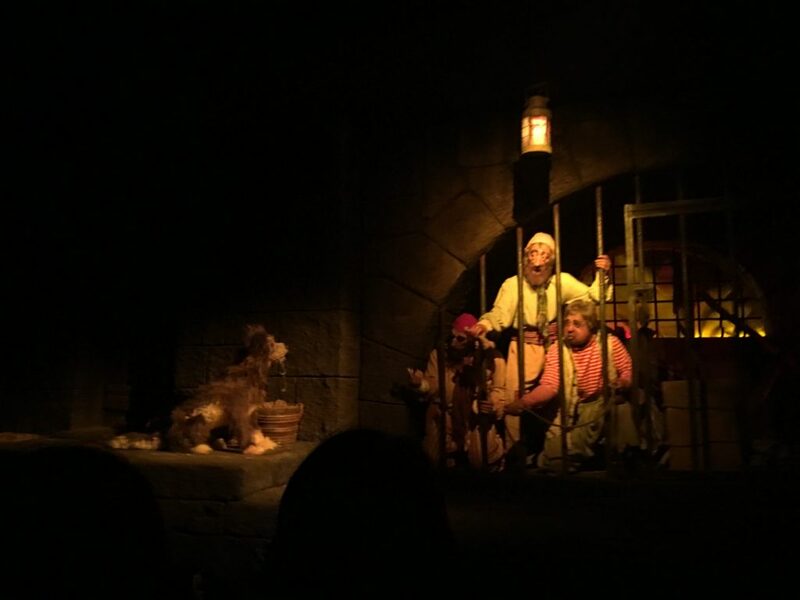 And truthfully as much fun as Pirates and Pals is fun, I’m not talking about it either! What I’m talking about it chartering your own private boat with Disney! Why it was so amazing! Watching Happily Ever After fireworks on a boat on Seven Seas Lagoon was the best viewing I’ve ever experienced! Yes, even better than the reserved seating with the fireworks dessert party. (It was pretty awesome too!) The view was stunning, completely picturesque and best of all, I didn’t have to fight for a place to stand! In fact, I sat and relaxed the whole time! 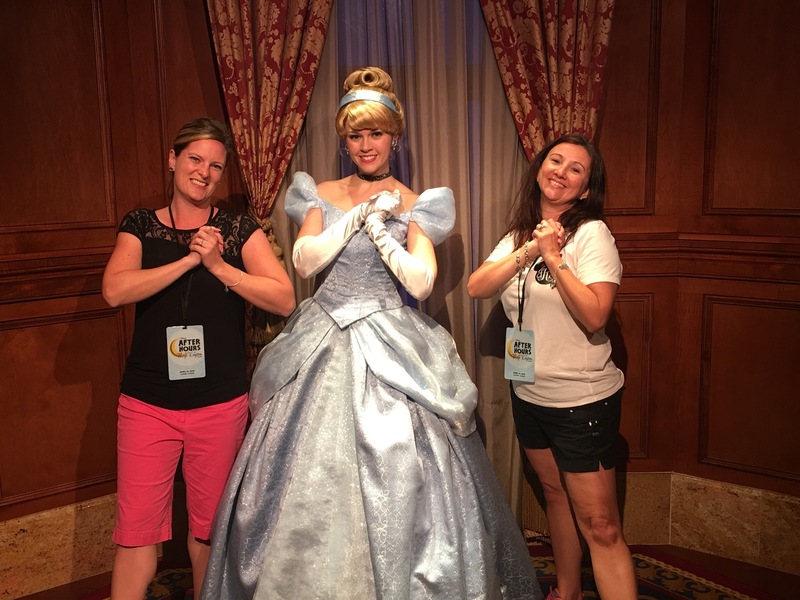 It was like our own private viewing of Happily Ever After! No heads in the way, no tired feet and completely uninterrupted music as it played over the boat speakers! 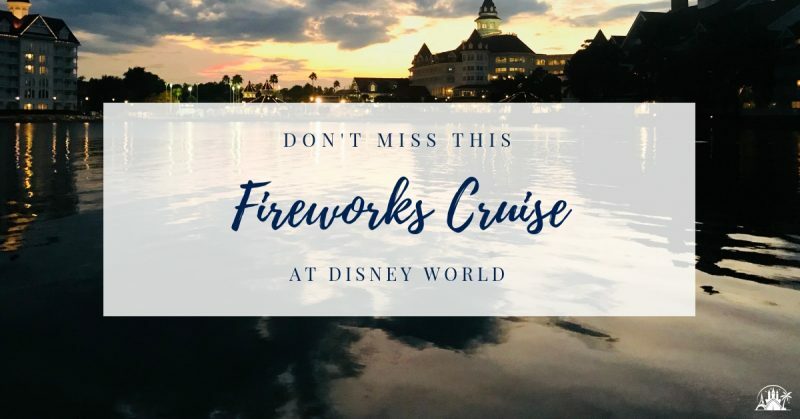 It’s an experience everyone should have if they love Disney and fireworks! Here’s how it works! And it’s less expensive than you would think! 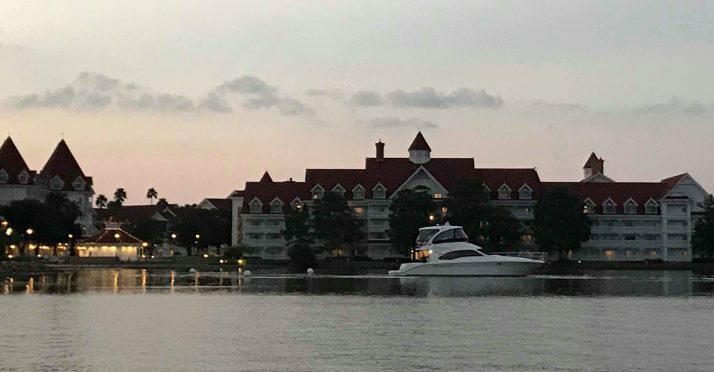 Disney owns approximately 27 pontoon boats and 1 very fancy Grand Yacht that can be chartered by guests each evening for the fireworks show. To book your chartered boat ask your travel agent to call 407-WDW-PLAY or visit Disney’s Speciality cruise page. Ideally you would make your reservation at 180 days prior to arrival but honestly, unless it’s a very popular time, think holidays, you’re ok to call in closer to your vacation. In fact, we booked our cruise only a month in advance for a weeknight sailing in September. 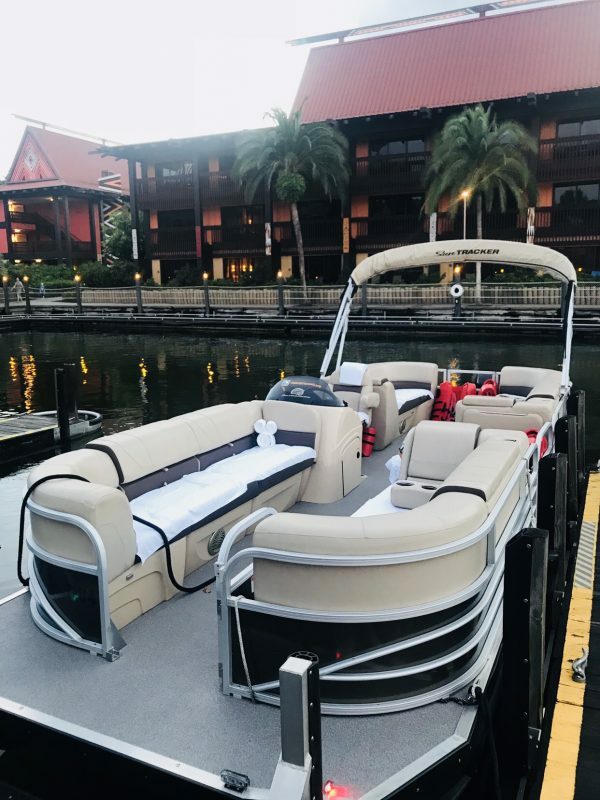 You will have the option to charter the Grand Yacht or a pontoon boat. They have two size pontoon boats that hold 8 to 10 people. The yacht is really pricey at a mere $800 per hour whereas the pontoon boats are much more affordable. We chartered a 10 person pontoon boat for $375.00 for the evening from 7:15-9 ish for an 8 pm fireworks show. The price does vary by season and rates are much higher for holiday nights. 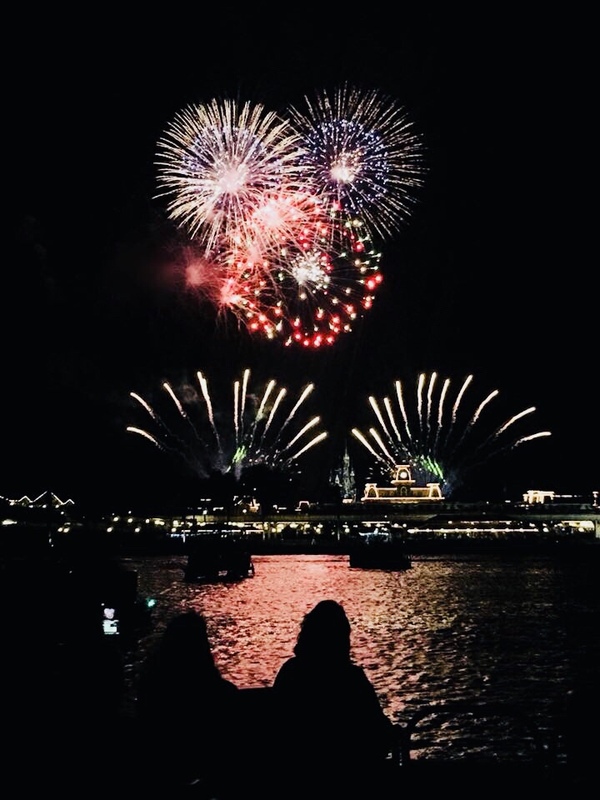 When you schedule your fireworks specialty cruise you will choose to meet your boat at Disney’s Polynesian Resort, the Grand Floridian, the Contemporary or Wilderness Lodge. 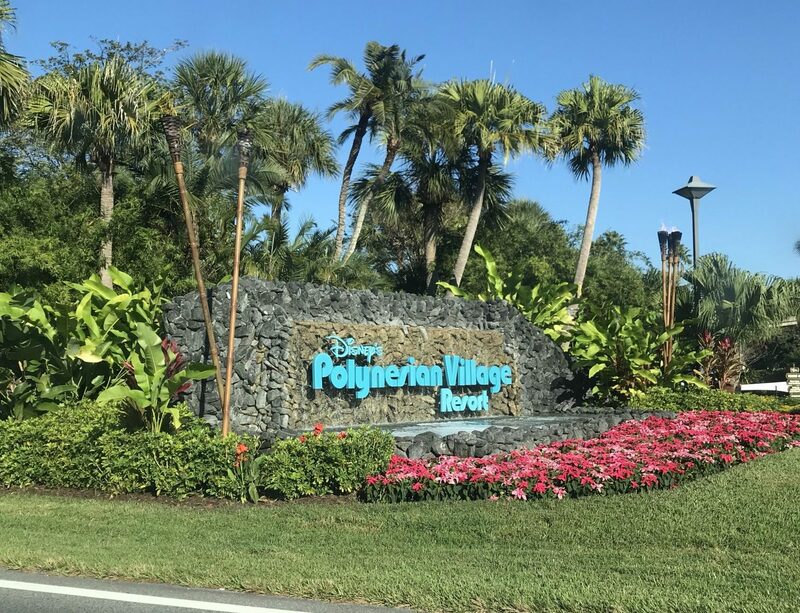 We chose Disney’s Polynesian Resort because we wanted to have dinner at their quick-service restaurant, Captain Cooks (one of my most fav quick service places to eat all over Disney World), prior to sailing. When you arrive at the resort you’ll head to the marina where you’ll meet up with your boat driver. 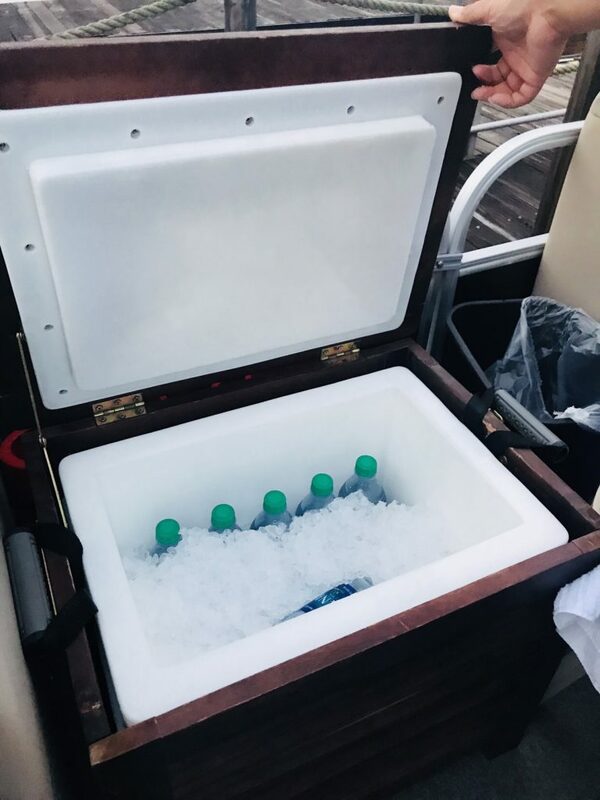 The boat is pristinely clean and waiting complete with soda, water, and a few light snacks. Once you’re aboard snap a picture and then it’s time to head out on the water! Decorations for special events like birthdays, anniversaries or honeymoons. 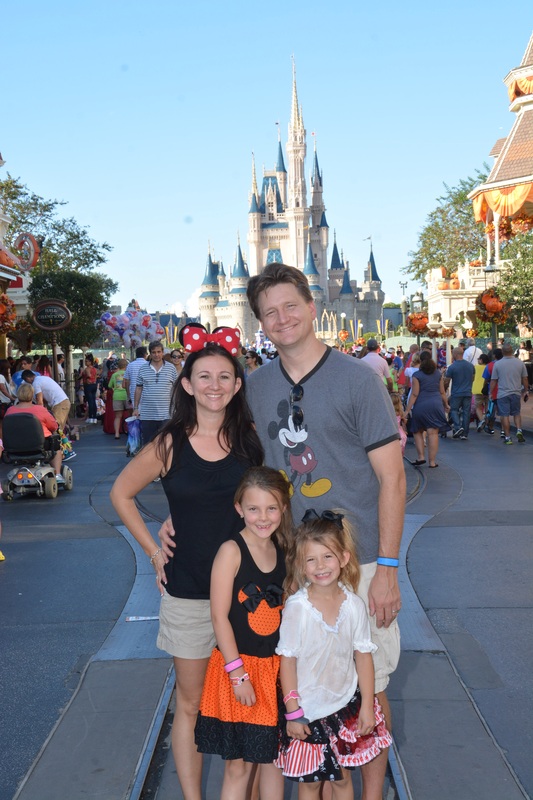 Mickey’s Not So Scary Halloween Party (MNSSHP) is my most favorite ticketed event all year at Disney World!? “It’s really not that scary!” and so much fun for kids and adults! It’s the perfect Halloween party for everyone! Mickey’s Not So Scary Halloween Party happens on 34 select nights at Magic Kingdom during the fall season!? This year the party starts in August and runs through October 31st. August is crazy early to be celebrating Halloween but the crowds showed up anyway and proved again that this is the best Halloween Party of the year!? And yes, I was one of the crazy ones to join the festivities?in August.? I just couldn’t help myself and of course, I wanted to share all of the spooky details with each of you! How much does the Halloween party cost? Ticket prices run between $75 and $125 per person and get gradually more expensive the closer the party date is to Halloween.? Weekend parties are also higher in price than weeknights.? You should get your party tickets early, not at the gate, because the parties often sell out on the night of the event.? For dates like Halloween and the couple days right before Halloween buy your tickets well in advance.? These nights will be sold out before you know it! How do I purchase party tickets? Are there party ticket discounts? On select nights there are discounts for annual pass holders and DVC members.? These discounts can be found by logging into your My Disney Experience account.? The correct price will be displayed when you navigate to the special events ticket area. What time does the Halloween Party start? Mickey’s Not So Scary Halloween Party starts at 7 pm and goes to midnight but what you should really know and plan for is that you can enter Magic Kingdom as early as 4 pm with your party ticket and the last show of the evening starts at midnight on the Cinderellas Castle stage.? This means you could be in Magic Kingdom into the wee hours of the morning! What if I’m a Magic Kingdom Day Guest? Day guests who do not have a ticket to Mickey’s Not So Scary Halloween Party will be asked to leave the Magic Kingdom at 6 pm.? It takes Cast Members well over an hour to usher days guests out of the park and have only party guests present in Magic Kingdom when the party begins at 7 pm! If you are a day guest staying for the party you do not need to exit Magic Kingdom and reenter with your party ticket.? You will simply find a Cast Member distributing party wristbands, show them your ticket and then enjoy the party.? ?You should, however, head to the Main Street bypass (this runs behind Main Street from Tony’s Town Square to Tomorrowland Terrace) and pick up your Trick or Treat bag and take the first few pictures of the night.? You can get a Trick or Treat bag at each Trick or Treat station but there’s a fun bag of candy handed out at the bypass stop! What time should I arrive for the Halloween party? If you are not a day guest and plan to go to Magic Kingdom for only the party (which I recommend) you should arrive at the gates of Magic Kingdom by 4 pm. After entering Magic Kingdom you will get a colored wristband from a Cast Member standing nearby.? This wristband shows that you have a Mickey’s Not So Scary Halloween Party ticket and will be allowed to stay for the duration of the party.? Without a wristband, you will be asked to leave Magic Kingdom. After you have your wristband you will enter Magic Kingdom as normal through the right entrance by Town Square Theater. From there Cast Members will direct you to the bypass where you will have the opportunity to take a few pictures and pick up your Trick or Treat bag. If you have food allergies let the Cast Member know and they will give you a teal Trick or Treat bag which you will use later to pick up all of your treats inside Town Square Theater.? More on food allergy?friendly treats below. Once you have left the bypass you are ready to take part in all of the Mickey’s Not So Scary Halloween Party festivities!? It is a good idea that you have somewhat of a plan in place to make the most of your party time!? There is literally so much to do and see that you can’t do it all so prioritize what is most important.? You simply can not do all of the party festivities in one night. I’ll share a touring plan below to help you get through a good portion of it!? For now, let’s talk about all the different components that make up the party fun! Will Cast Members make me leave if I don’t have a ticket to the party? Cast Members are positioned throughout the park and will ask to see your Mickey’s Not So Scary Halloween Party wristband.? If you do not have a wristband you’ll be directed toward Main Street and not be allowed to pass through to other areas of the park. Cast Members are very nice about asking you to leave if you don’t have a party wristband but they are also very systematic about it and you will be slowly pushed out of the park.? It’s actually quite neat how they just slowly guide you towards the gates without ever being pushy about it. 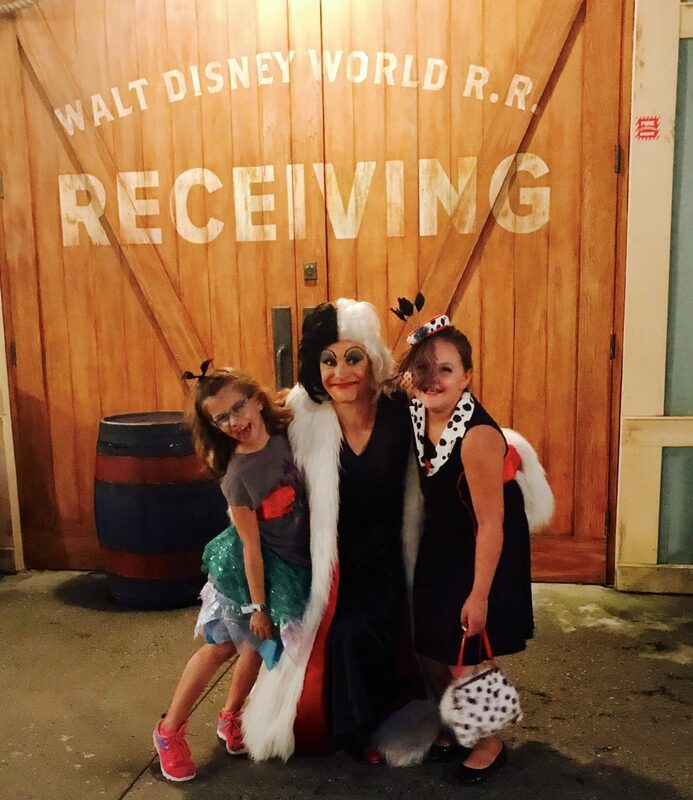 Costumes at Mickey’s Not So Scary Halloween Party are not just for the kids! In fact, they’re encouraged for all guests!? And I highly suggest you do wear a costume or at least a festive shirt and ears. One of my favorite parts of the Halloween parties is the families that dress up in a theme.? 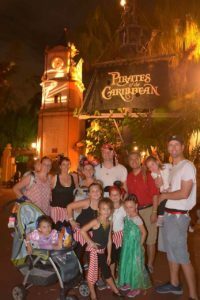 We’ve done a few different family costumes throughout the years like Peter Pan and a Pirate family. And if costumes aren’t your thing consider wearing a fun Halloween shirt and Halloween ears.? I’ve done this a few times too! Do keep in mind that it is still hot and muggy in Orlando all through the fall season including Halloween day.? The temperatures don’t cool off into a brisk fall air in Orlando like they do in other parts of the country.? So you will want to make sure that your costume is cool and comfortable and made with materials that breathe. Character lovers love Mickey’s Not So Scary Halloween Party for the opportunity to meet a few rare characters up close!? They vary from year to year but there are always a few that are extra special on the list. These rare characters that have the longest wait times, sometimes 3 hours or more and will require some planning if you really want to meet them.? In fact, if you have a character that’s on your must meet list, plan to meet them first before doing anything else.? Some character meets start as early as 5 pm (which is before the party actually starts).? You will want to be hanging around the meetup spot just prior to the character’s arrival to be in line as early as you can. It would be nearly impossible to meet all of the characters in one night, see all of the shows and Trick or Treat.? If you want to meet characters I suggest you pick on or two top priorities and do those first.? Then move on to the rest of the party. 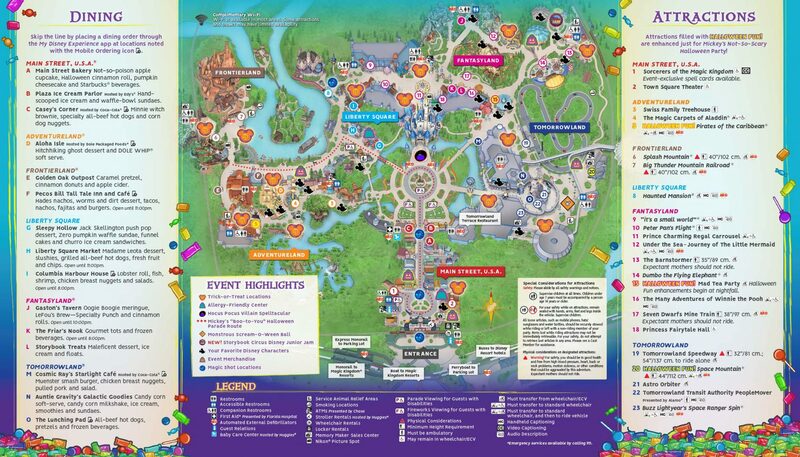 The Mickey’s Not So Scary Halloween Party map has icons of Mickey Mouse to show you character locations. The map does not, however, tell you what character is located where.? If you want to see a particular character you can use my guide below or ask a Cast Member while you’re at the party.? Characters are subject to change without notice. * Notates popular characters that will have long wait times.? See the Touring Plan below to plan your night and how to meet the most popular characters. Besides the rare character meet and greets my favorite part of Mickey’s Not So Scary Halloween party is the parades and shows!? There are several event specific shows for the party and they all play multiple times so you don’t have to worry about missing it!? 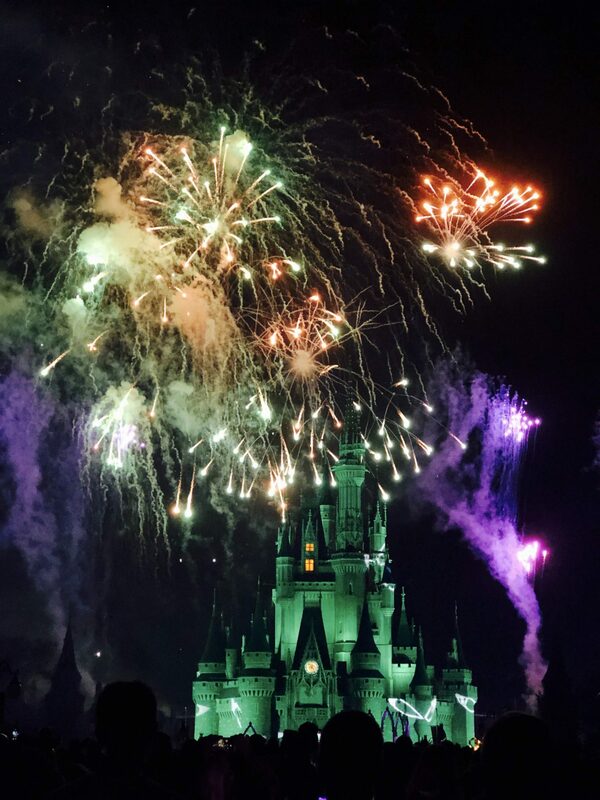 Hallowishes is the only event of the night that happens ONE TIME ONLY at 10:15 pm! Here’s what you need to know and shouldn’t miss in my opinion! Hocus Pocus Villain Spelltacular happens on Cinderellas Forecourt Stage 3 times each party evening.? We all love the Sanderson sisters from Hocus Pocus and even if you don’t you’ll love the appearance of several of Disney’s greatest villains and the very popular Oogie Boogie! Shows are at 8:30, 10:45 and 12 am. For a good view of the show, you should be somewhat close to the stage but keep in mind that the stage is very tall.? If you are too close it can be tough to see.? I would stand somewhere between the stage rope and the hub street but you could easily stand back by the Partners statue and still have a good view. 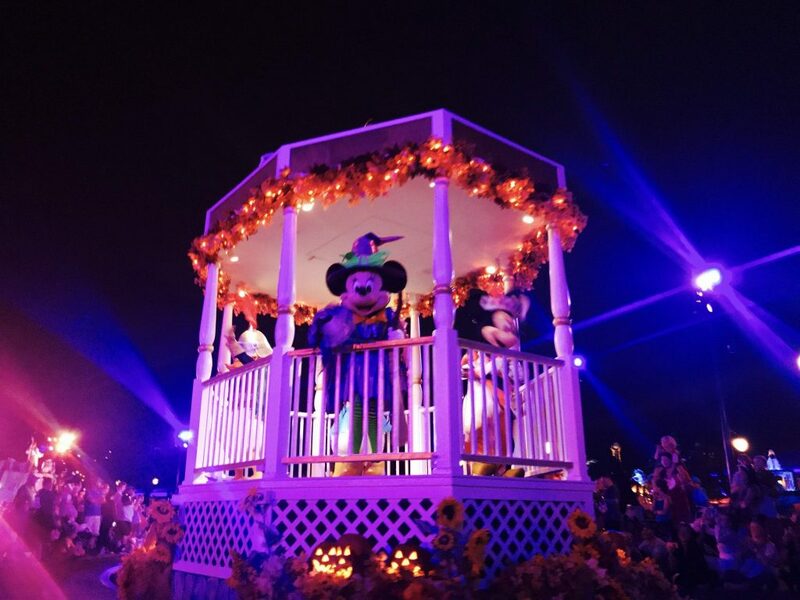 Mickey’s “Boo-To-You” parade is the BEST parade of the year!? I literally watch it twice every time I go to the party!? I love it that much!? 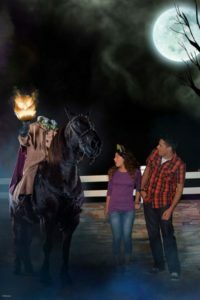 The parade begins with the Headless Horseman riding down the parade route.? It’s spectacularly spooky! Following the Headless Horseman are villains galore and my favorite, the Grave Diggers who scrape their way down Main Street all while the Boo-To-You theme song plays along.? I simply love it!? The parade happens twice each evening at 9:15 and 11:15. To have a front-row view of the parade make sure to arrive at your preferred location 30-45 mins prior to the parade start time.? 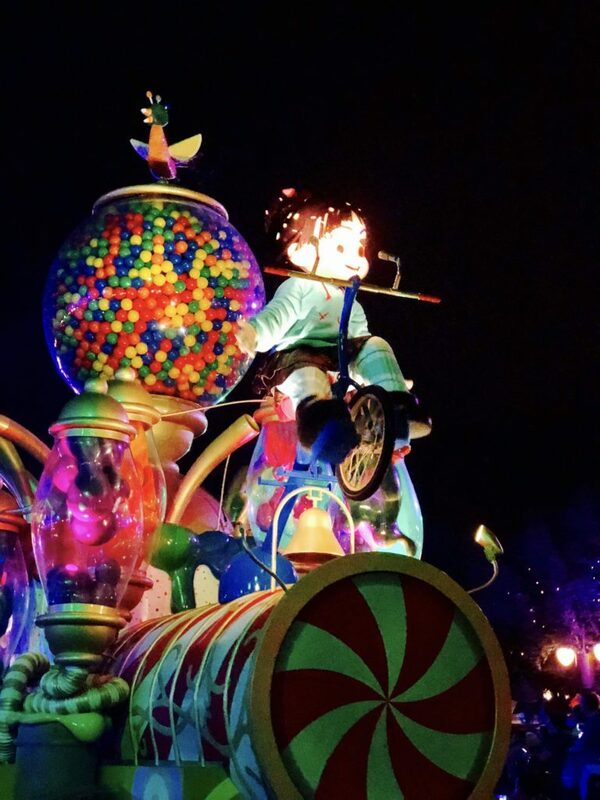 I personally prefer to sit near Casey’s Corner so that I am in a prime viewing spot to see the fireworks afterward or a little further up where the floats make the turn from the hub and head down Main Street. (When looking at the castle I like to be on the left side but be careful not to be too far up and off the parade route). Hallowishes fireworks happen once each evening at 10:15. Don’t miss it!? 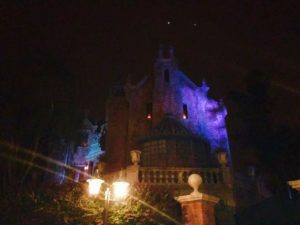 “Delightful Frights fill the night as favorite Disney Villains conjure up and unforgettable Halloween spectacular” high above Cinderellas Castle!? The fireworks for this show are amazing and literally light up the sky in 180-degree view! For the best view find a spot somewhere between Casey’s Corner and where Main Street meets the hub (circle in front of Cinderella’s Castle).? Anything closer and you won’t get the full effect of the 180-degree fireworks and some of the fireworks behind the castle will be blocked. At this fun dance party at the Tomorrowland stage, you’ll be able to meet up and dance the night away with Mike Wazowski and Sulley.? The dance party happens all night long and I suggest you stop by for a quick dance while passing from one place to the next.? Mike and Sulley are out the whole time but do note that they may take a bathroom break or two.? You should also know they won’t stop dancing or pose for a picture.? It’s a dance party and they have to keep moving! I’ve yet to see this party but I assume it’s very similar to the Monstrous Scream-o-ween ball but with our favorite Disney Junior characters.? I’ve heard you’ll dance the night away with Doc McStuffins and Timon from Lion Guard.? I’ll find out more on my next visit to the party in September!? You’ll find this dance party near Pete’s Silly Side Show in Storybook Circus. I love the Cadaver Dans Halloween party performances!? They add so much to the spooky festivities.? 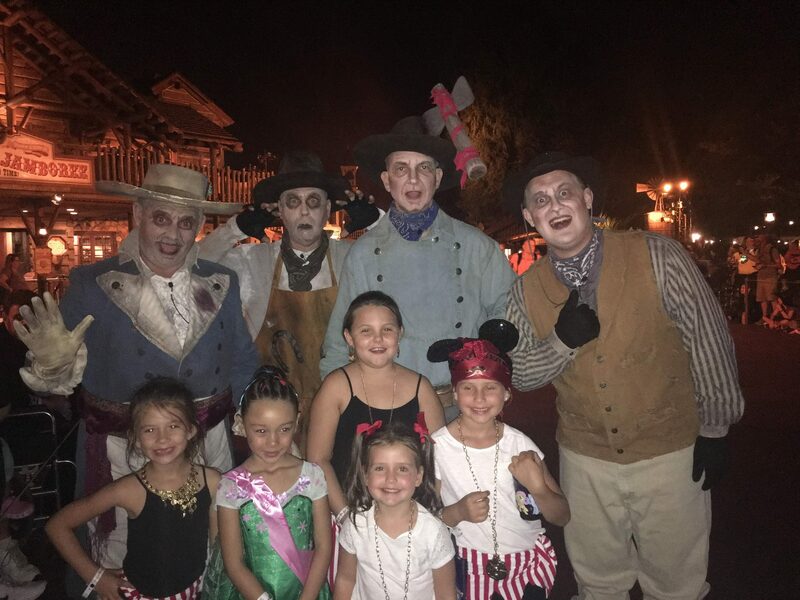 You’ll find them each evening in Frontierland performing?songs like Boo to You, Cruella de Vil, and the Headless Horseman at 7, 7:45 8:30, 9:50 and 10:30 pm.? If you hang around after the performance they’re happy to take a quick picture with you! Like all special events and seasons at Disney World, there are yummy and festive treats for Mickey’s Not So Scary Halloween Party too!? 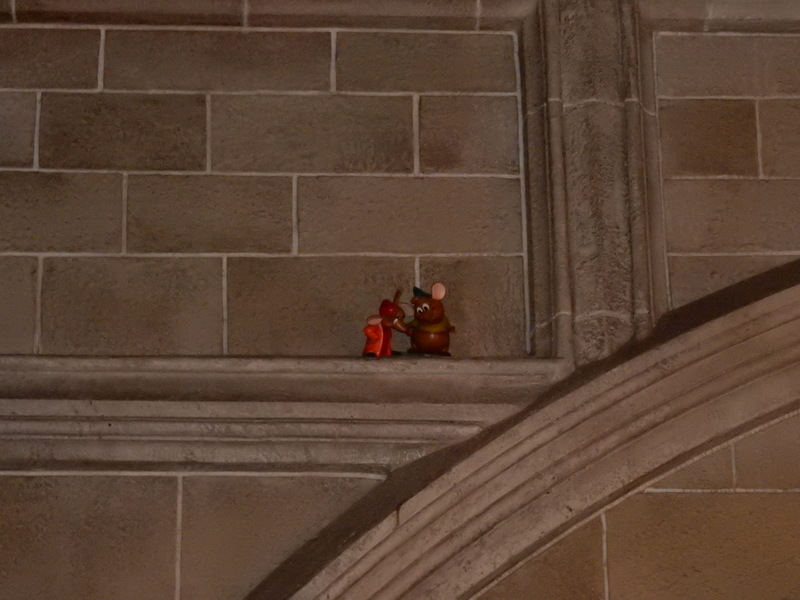 You’ll find them throughout Magic Kingdom.? Some of these special treats are offered throughout the day and a few are only offered at the party. The Hallowishes dessert party works just like other Magic Kingdom fireworks dessert parties in that you will have an exclusive selection of desserts at Tomorrowland Terrance about 1 hour prior to the fireworks show and then choose between viewing the fireworks from Tomorrowland Terrace or from the Plaza Garden. The price is dependent upon the viewing location you choose.? Tomorrowland Terrace view $84 per adult, $50 per child or the Plaza Garden View $69 per adult, $41 per child.? A valid party ticket is also required.? 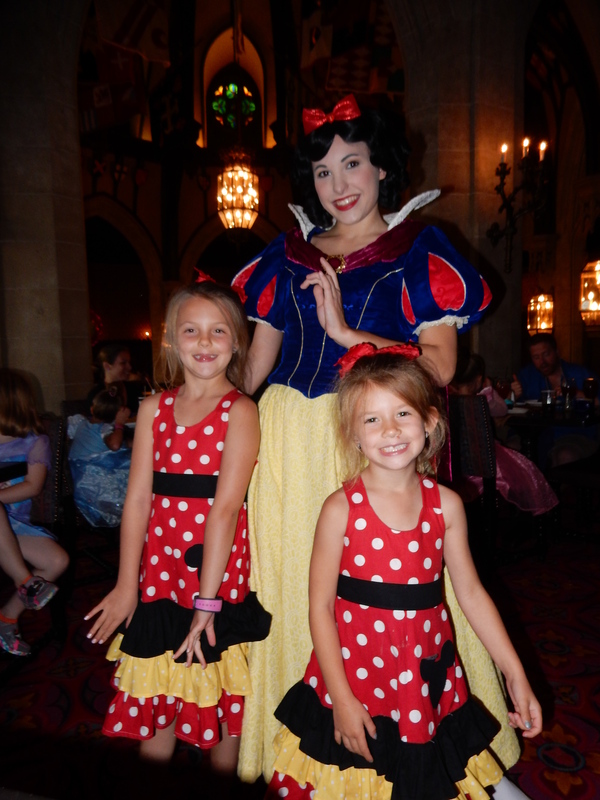 Reservations can be made on your My Disney Experience account or by calling 407-WDW-DINE. Personally, I don’t think this is a good use of your party time.? You will spend a good majority of the evening eating deserts while seated at a table inside Tomorrowland Terrace.? If you’re interested in attending a dessert party (which I do recommend) choose a regular park night to do so when you won’t be missing all of the fun experiences and entertainment exclusive to Halloween party guests. 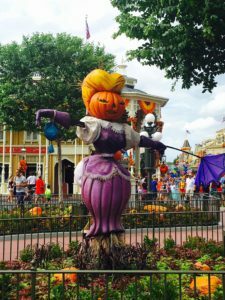 What Magic Kingdom attractions are open during the Halloween Party? 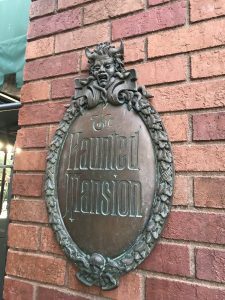 Many of Magic Kingdoms attractions are open during Mickey’s Not So Scary Halloween Party, however, there is only a handful I would choose to do during party hours!? My rule of thumb is if you can experience something during a normal day at Magic Kingdom don’t waste your party time on it! 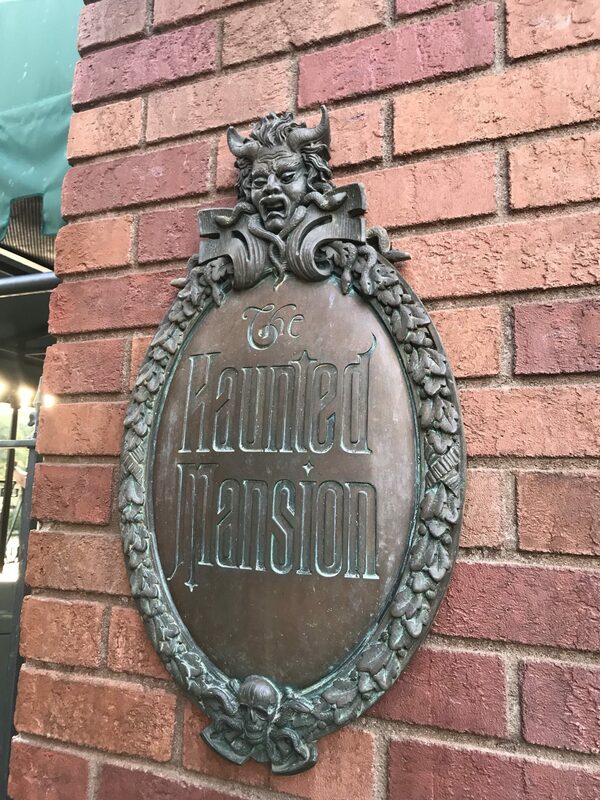 Haunted Mansion – while the attraction itself is the same, this is still one I would visit during the party for a few reasons.? First, there are some extra characters out front that put on a great show and you can also take your picture with a Hitchhiking Ghost! More on this below in Magic Shots! Mad Tea Party – Halloween Fun! – special lights add to the Halloween festivities while you’re riding the teacups! 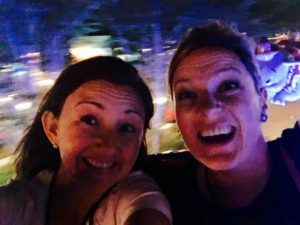 Space Mountain – Halloween Fun! A new soundtrack and lighting effects too make it spooktacular! Disney is known for the Magic Shots during normal park hours and Mickey’s Not So Scary Halloween Party is no different!? There are so many fun pictures to take while partying the night away. You do need to have Memory Maker (photo pass) to be able to download the photos however the photographers will take pictures with your camera you’ll just be missing the magic! There are 14 Trick or Treat stations around Magic Kingdom and you’ll be surprised to find that the handfuls are generous and the candy is name brand and totally worth eating. As you walk the park you’ll look for these Trick or Treat poles and then walk through the lines, which move really quickly and collect your goodies. If you have food allergies you’ll pick up a teal token to return later in the evening to trade for allergy friendly treats.? More on this below. When you enter Magic Kingdom you’re directed behind Main Street through the bypass where you’ll be handed a bag to Trick or Treat with.? These bags are fairly small but sturdy yet if you Trick or Treat at very many stations your bag will be full pretty quickly.? Cast Members at the treat stations will give you an additional bag or I prefer to pick up a reusable bag for my candy.? You can find the party bags in multiple locations throughout Magic Kingdom for about $4.99. Personally, I don’t plan out my evening with Trick or Treating in mind.? 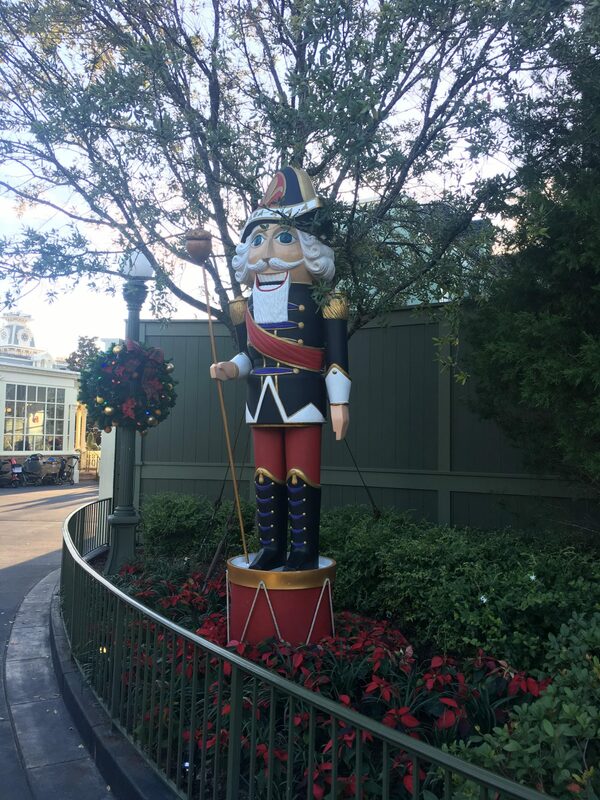 I tour Magic Kingdom in the order of entertainment and attractions I want to experience and then Trick or Treat along the way when a station is nearby. Trick or Treat stations are also noted on your party park map but honestly, you can’t miss the stations with the large lit up Trick or Treat poles! 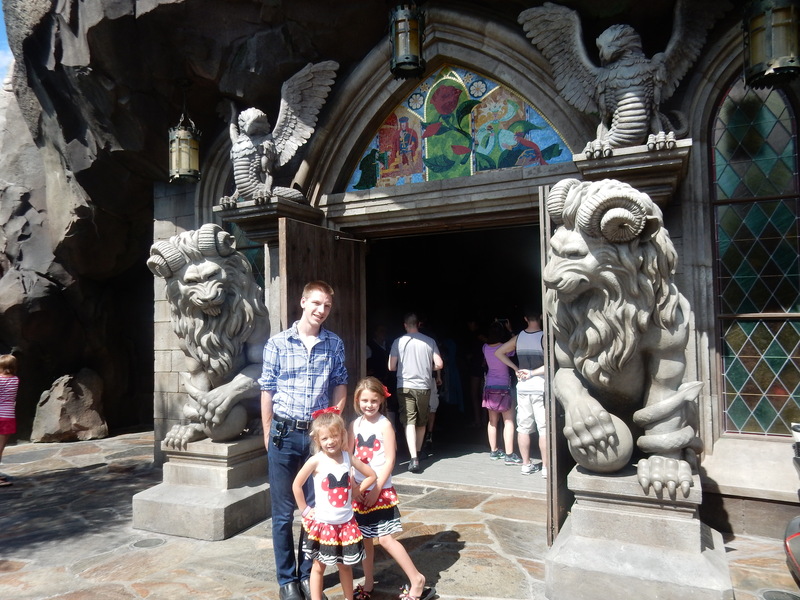 Disney is fantastic with food allergies!? It’s one of the few places I visit that I know I will eat well and eat safely.? 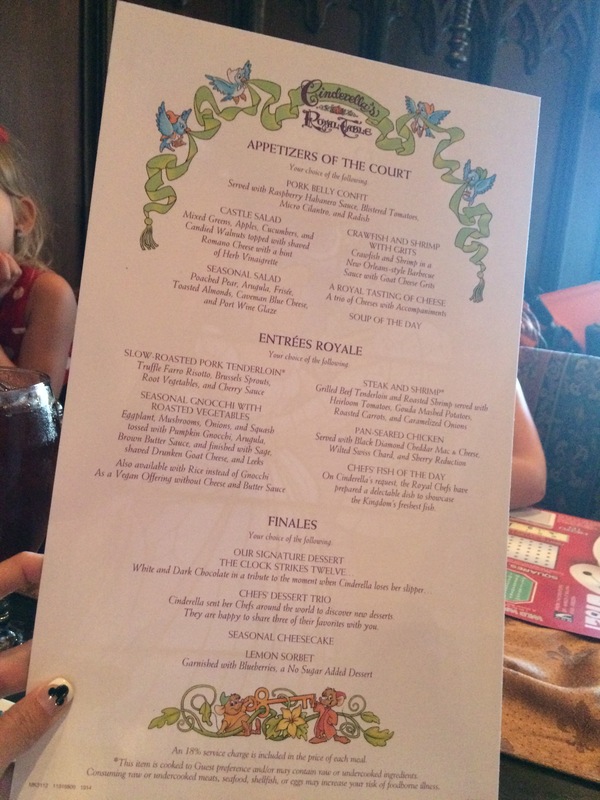 Their menus are extensive and full of things I don’t normally get to eat while out and Mickey’s Not So Scary Halloween Party isn’t any different! After entering Magic Kingdom and through the bypass Cast Members will be handing out Trick or Treat bags.? You will ask the Cast Member for an allergy-friendly Trick or Treat bag.? You’ll get the teal bag in exchange for the normal Trick or Treat bag and forego the first bag of candy handed out in the bypass. At each Trick or Treat station you’ll be handed a teal chip rather than candy to drop in your bag. 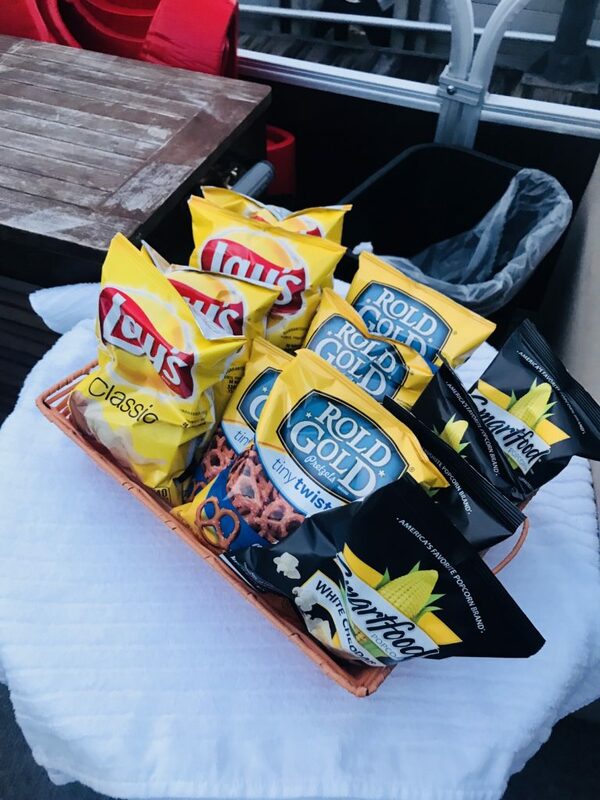 At the end of the evening, you will take all of your chips and your teal Trick or Treat bag to one of the two Allergy Friendly Centers where Cast Members will exchange your chips for a bag full of candy. The two Allergy Friendly Centers are located at the Liberty Square Ticket office and at Town Square Theater. Note: You don’t need multiple chips to get more than a piece or two of candy.? In fact, you don’t need anything more than your teal bag.? The chips serve as something to be handed out in the Trick or Treat line for kids and adults to feel included in the fun.? However, if you don’t want to Trick or Treat you can still return to one of the two Allergy Friendly Centers and have your candy bag filled to the brim with treats. I have experienced a couple of times where the most popular allergy friendly treats run out.? The Cast Members do what they can to keep the candy stocked but they do run out and have to wait on refills.? If candy is an important part of your experience I do suggest you go to one of the Allergy Friendly Stations earlier in the evening rather than waiting until you are ready to exit the park when the party is over. Several great brands of allergy-friendly treats are available for guests.? In fact some of my favorite allergy friendly candy I tried for the first time at Disney! You’ll be asked to choose which items are safe for you from their candy menu and then your bag will be filled.? If all of the items are safe you can simply tell them you’d like some of everything.? Cast Members will not choose for you!? They don’t want to be responsible for adding something to your treat bag that is not safe for you or your child. 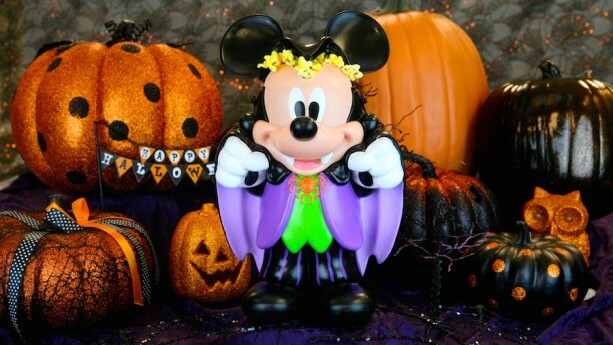 There is so much fun Mickeys’ Not So Scary Halloween Party apparel and memorabilia.? Anything that is specific to the party requires are party ticket to purchase it.? Cast Members will stop guests without a party band from entering the party merchandise area prior to the day guests leaving. 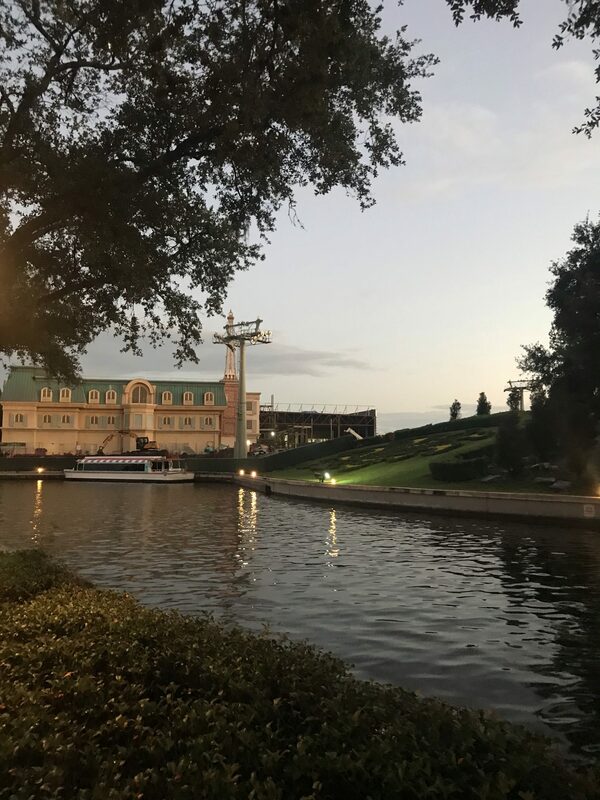 Emporium – apparel, ornaments, totes (what I use for Trick or Treat bags), trading pins, and the official party Magicband. Big Top Souvenirs – apparel, ornaments, totes, trading pins and the official party Magicband. 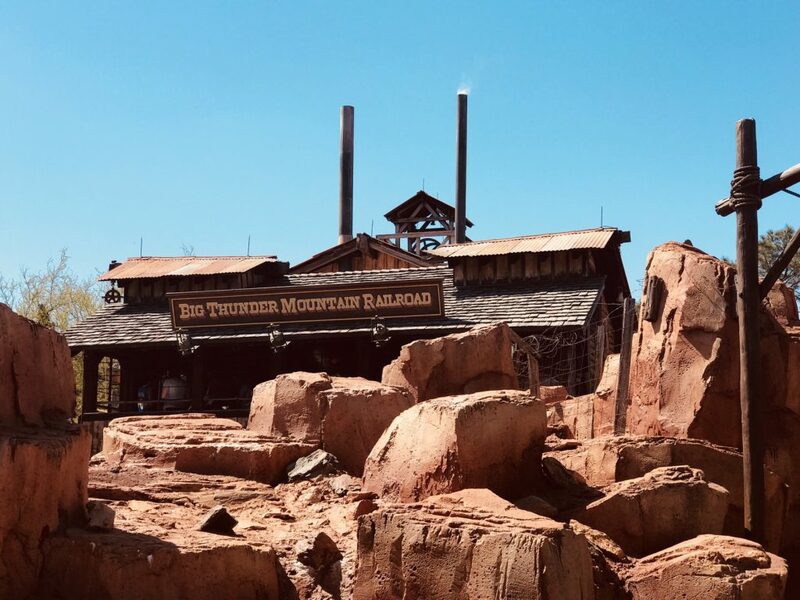 Frontier Trading Post – trading pins and the official party Magicband. In addition to MNSSP specific merchandise, Disney offers plenty of non party related Halloween themed items. You can see them on my Facebook page here. In order to make the most of your party time, I would have a plan in place before arriving for the evening.? Below is the plan I would follow for the evening.? Please note that I have NOT covered all of the special attraction overlays or character meet and greets.? It is impossible to do everything the party has to offer in one evening.? So if there is something you really want to do but I have not listed please swap your priorities with an item on my touring plan you don’t want to do. 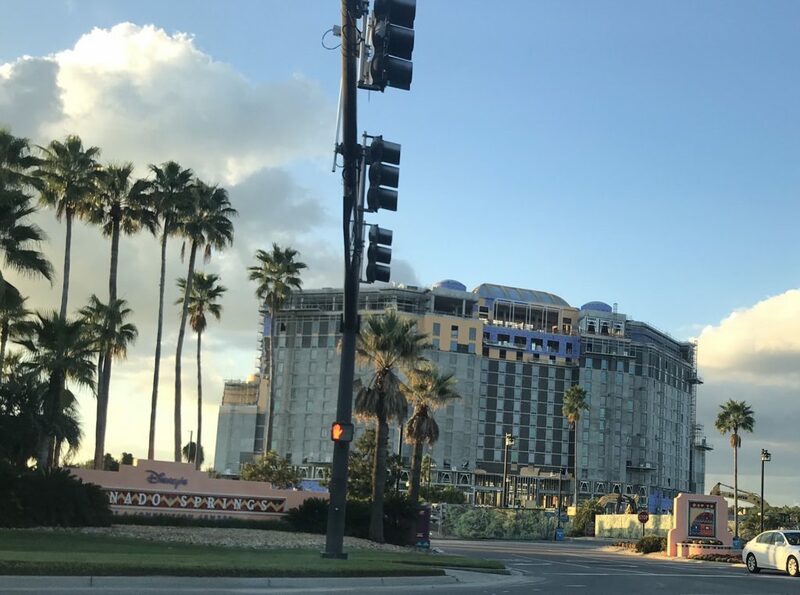 Notes: Trick or Treating and dance parties (Monstrous Scream-o-ween Ball and Storybook Circus Disney Junior Janm) should be attended as you pass by them on the way to your next prioritized location. 4:00 pm – 4:30 pm? Be at the ticket gate and entering Magic Kingdom at 4 pm. Follow Cast Member directions and enter the bypass street to collect your Trick or Treat bag and first set of goodies. Don’t be distracted by the many picture opportunities as you enter.? Save these pictures for later in the night. Pick one of the three early character arrivals and head that direction.? Jack Skellington & Sally* (5 pm arrival), Seven Dwarfs* (6:15 pm arrival) or Moana* (5:45 arrival).? ? ?You should be in line at least 30 minutes prior to your top character’s arrival possibly sooner for Jack Skellington & Sally or the Seven Dwarfs.? These are the two most popular character meet and greets at the party and the lines easily have 2-3 hour waits throughout the night. Depending on how long your first character meet up took you can choose a second character to meet.? Ideally, it would not be one of the most popular characters unless your party priorities are only?the character meet and greet. Note: choose the attraction you are most interested in riding.? If there is the time you can choose your second choice and so on. Ride Space Mountain with it’s Halloween Fun! If you have the time or interest meet with?Alice in Wonderland, The Mad Hatter, Tweedle Dee & Tweedle Dum, Queen of Hearts?you won’t have time to meet with all of them. Look for the roaming characters and request a picture with them. 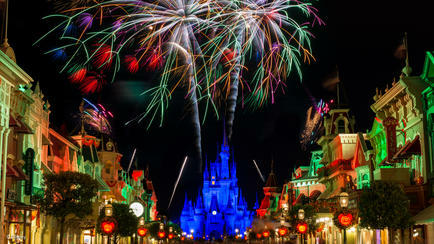 Find your place on Main Street for Hallowishes.? I suggest sitting somewhere near Casey’s Corner for the best view of the fireworks.? If you find a spot on the curb you can easily sit right there and wait for the Boo-to-You parade after the fireworks. Find a spot on the curb on Main Street to watch the Boo-to-You parade.? The parade route will fill up quickly so it’s best to get a spot as soon as the fireworks are over.? One person can hold the spot while another?a grabs treat from the Boardwalk Bakery or other nearby locations or wander in the stores to pick up party merchandise. After the parade is over move towards Cinderellas Castle forecourt stage and find a spot to see the Hocus Pocus Villian Spelltacular.? If you are in front of the Partner’s statue you’ll have a good viewing spot. After the Hocus Pocus Villian Spelltacular, you can use this time to take your Magic Shots on Main Street and shop in the stores for party merchandise. All attractions will be closed but Main Street remains open until the wee hours of the night letting guests shop and enjoy treats down Main Street. Tickets NOW on sale! ?Contact me to get yours today jamie@loveofthemagicvacations! *Note: Tickets sell out most dates. ?Purchase tickets for the first party and party on Halloween night ASAP! 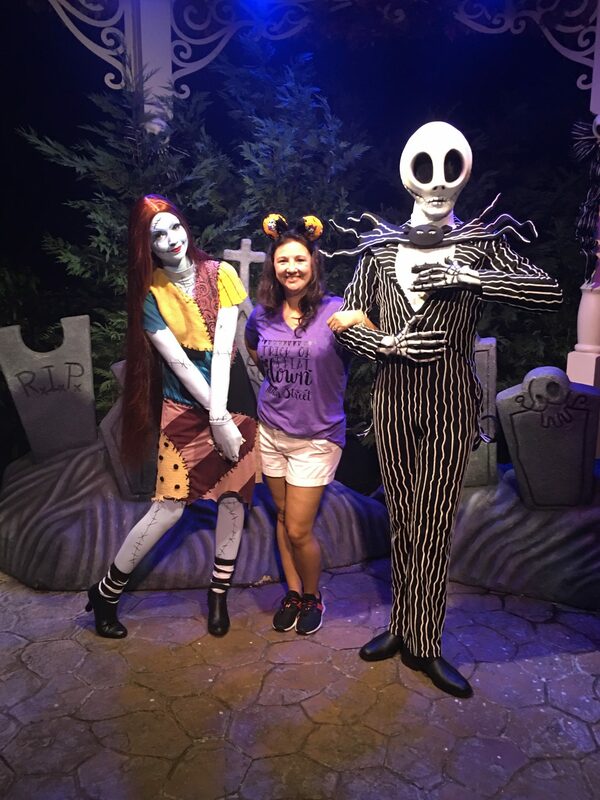 Mickey’s Not So Scary Halloween Party is my favorite party at?Disney World! ?The decor is amazing and party activities are worth the ticket cost! ?2017 party dates span 4 months, starting at the end of August and going through the first of November. Stop to take your picture on Main Street where you can get a full view of the fall decor, Main Street and Cinderella’s Castle! The party starts at 7 pm and goes until midnight, however you can enter Magic Kingdom as early at 4 pm. ?This party requires an extra ticket which varies in price depending on the night you go. Costumes are for Adults too! Costumes are allowed and encouraged for both adults and children however they must be family friendly, meaning not too scary. ?Capes can not be longer than waist length, costumes cannot include accessories that look like weapons and no full face masks; eyes must be visible. The party doesn’t technically start until 7 pm, but you can enter Magic Kingdom as early as 4 pm. ?You will be asked to go through the turnstiles to the right side of the entrance. ?From here you will be given your party wristband. ?This is what shows you have purchased a party ticket and can stay for the evenings events! ?Take your picture in front of the Train Station (before entering the park) with all of the fall decor. After entering head to the right, Cast Members with party signs will usher you towards the park bypass. ?During party nights, the bypass is being used to give party goers their Trick-or-Treat bags and provides a stop for the first candy station. ?The bypass gate can be seen just to the right of the party sign, next to Tony’s Town Square. Check out these oh so adorable Halloween character statues just inside the bypass gates! ?These are just a few of them! ? I LOVE the entertainment at Mickey’s Not So Scary Halloween Party! ?Here’s what you will see! Hocus Pocus Villain Spelltacular – this show is on the castle stage 3 times an evening. ?8 pm, 9:15 pm and 10:40 pm. ?It’s a must see! Cadaver Dan’s Barbershop Quartet plays throughout the night in Frontierland. ?A not so spooky twist to your typical barbershop quartet! ?This is so entertaining! If you’re lucky, you can get a picture with them! ?Don’t be afraid to ask! Most of all, don’t miss Hallowishes! ?The Halloween version of Wishes fireworks! ?This fireworks show is grand in size featuring perimeter fireworks, meaning a 180 degree view! LOVE! ?The music changes to feature some of your favorite spooky songs and Disney villains! ?Hallowishes happens one time each night at 10:15 pm over the top of Cinderella’s Castle. ?Don’t stand too close to the castle or parts of the fireworks will be blocked. ?Anywhere behind the Hub is perfect! ?I always enjoy the fireworks from the new Hub grass!? Scream-o-Ween Dance party happens throughout the night at the Tommorrowland Stage.? Celebrate the Magic Villain’s Style Castle Show – This show is projected onto Cinderella’s Castle which magically transforms into the most amazing backdrop! ?Nightly at 10 pm. As the crowds come together on Main Street to get ready for the first parade, there is a lot to be seen! ?There’s a great excitement in the air! ?This truly is a party you can’t miss! Jack Skellington balloons! 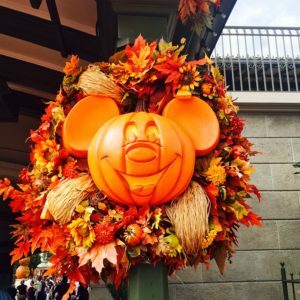 I love these Mickey pumpkin wreaths! ?They are all down Main Street and light up at night! The castle is lit up in Halloween colors! ?Main Street takes on a special party glow in oranges and greens! Halloween Party Character Mania! Locations for 2106 / 2017 coming soon! Characters are a big part of the party! ?You will be able to meet some hard to find characters as well as a few of your favorites dressed in their Halloween party attire! Mickey & Minnie dressed in Halloween?attire. ?I LOVE Minnie’s dress!? Jack Skellington & Sally, party favorites are located in Liberty Square. Pooh, Tigger, Eeyore & Piglet are also dressed in their Halloween costumes outside Pooh’s attraction.? ?Not a great picture, but it gives you the idea. The 7 Dwarfs! Another party favorite! ?They are in Fantsyland near the 7 Dwarfs Mine Train. ?The 7 Dwarfs are very popular. ?If you want to meet them, make sure to line up to see them when the party starts, if not 15-20 minutes earlier. Lots-o-Huggin’ Bear is with Buzz in Tomorrowland in between Buzz Lightyear’s Space Ranger Spin and Carousel of Progress. More pictures of exclusive characters to come! Exclusive Halloween Party Merchandise 2016/2017 coming soon! 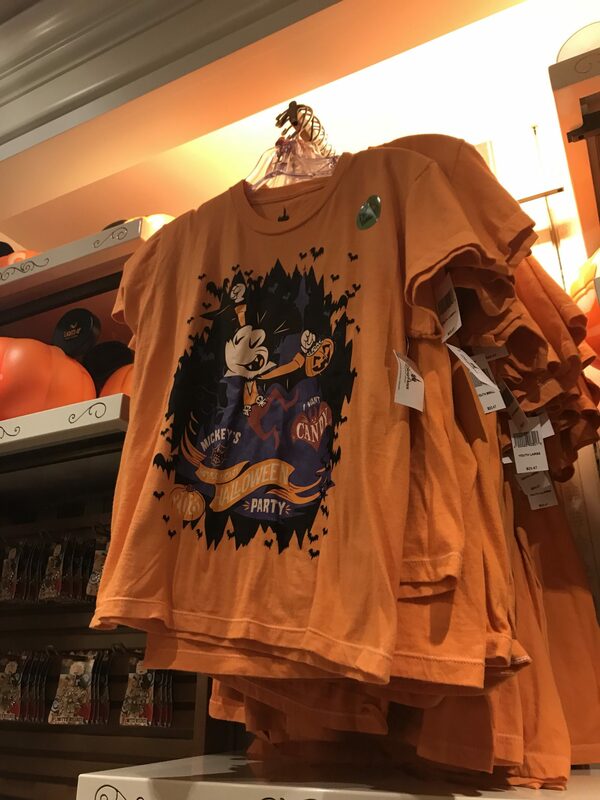 Each year Mickey’s Not So Scary Halloween Party brings out exclusive party merchandise, meaning you can only buy it at the party. ?Even if you are there as the party starts and wandering through the Emporium on your way out, you will not be allowed to purchase exclusive merchandise without a party wristband.? ? This year’s party exclusive merchandise includes a party MagicBand, trading pin and T-shirt. ?You can find them in a few places.? 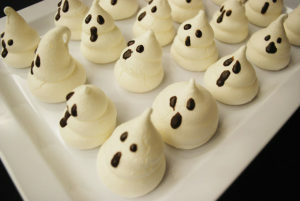 There are many Halloween party treats available for purchase throughout the park! 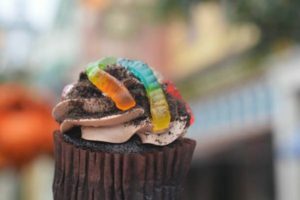 Spider Cupcake and Worms & Dirt at the Main Street Bakery? Creepy Ice Cream Cookie Sandwich at Plaza Ice Cream? 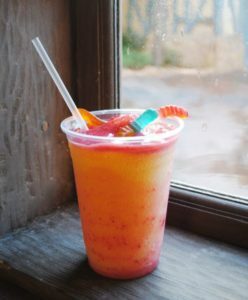 Ghoulish Strawberry Lemonade Slushy at Friars Nook? Candycorn soft-serve ice cream at Storybrook Treats? Candycorn Cotton Candy throughout the park? Vampire Mickey Popcorn Bucket at popcorn stands throughout the park? Halloween Hot Mug throughout the park? Poison Apple Stein at Plaza Ice Cream? Trick-or-Treat at 13 stations throughout the park. ?You will load up on some of your favorite candy at these stations! ?Disney will give it out by the handfuls! ?Look for these…? ? 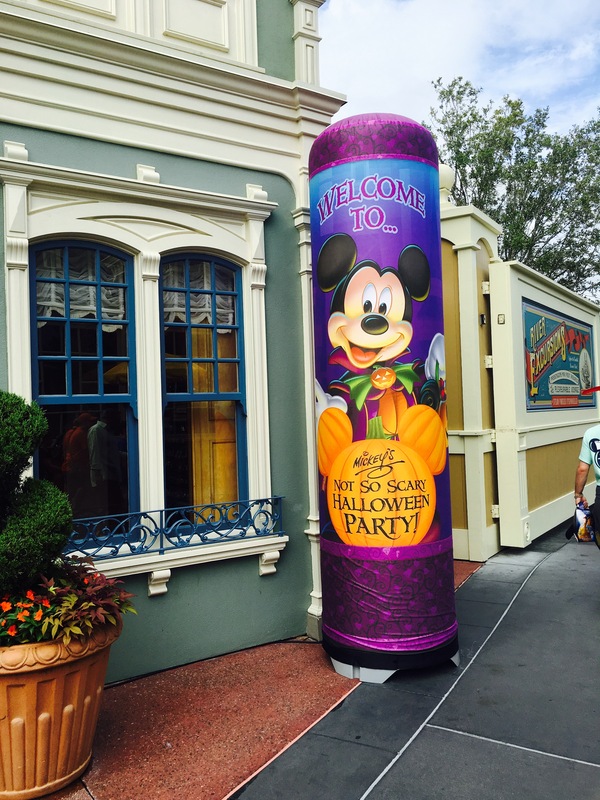 Mickey’s Not so Scary Halloween Party is now Allergy Friendly!!! 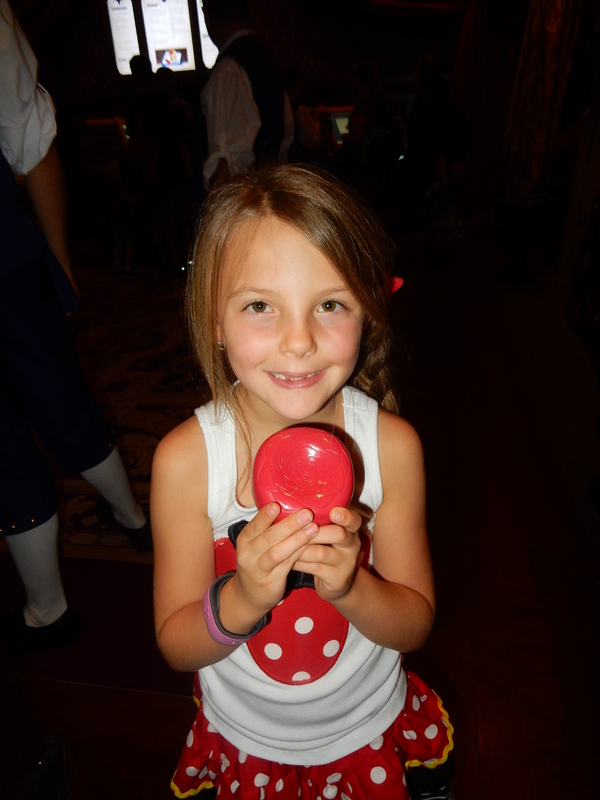 New in 2016 Disney has allergy friendly trick-or-treat options! ?This makes my food allergy suffering self beyond happy! 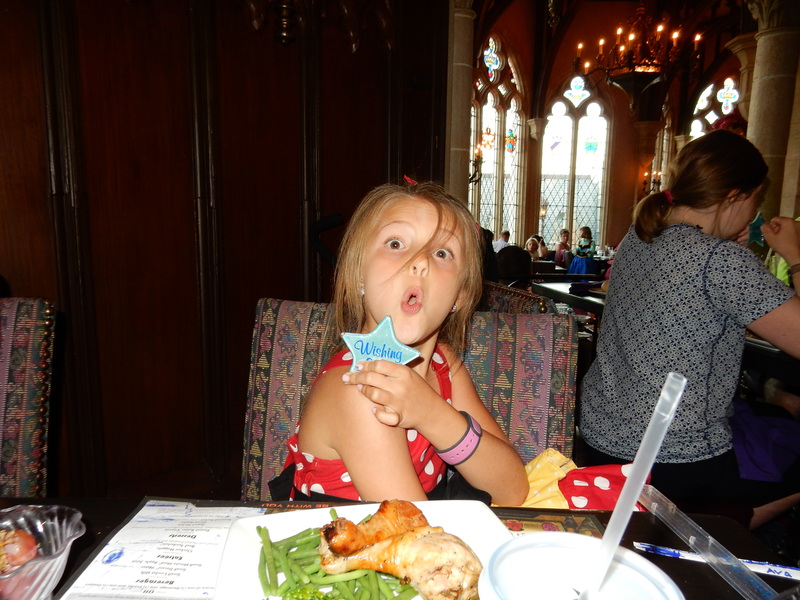 ?Eating at Disney with food allergies is easy, it’s one of the many reasons I LOVE Disney! ?No longer does my family have to skip trick-or-treating at the party! Don’t miss the magic shots at the party! ?Take your picture with one of Disney’s Photopass cast members at select locations and when you view your picture later, you’ll be surprised to find a few extra guests taking the picture along with you! New this year are animated magic shots! ?Pre-purchase Photopass for $169 (at least 3 days prior to arrival) to get the animated shots! As if there wasn’t enough fun already happening, there’s a little extra magic to be had! If you play the Sorcerers of the Magic Kingdom game, or would like to start, go to the Fire Station and pick up your exclusive party card!? Make reservations early for the Hallowishes Dessert Party at the Tomorrowland Terrace. ?The cost is $79 per adult and $47 for children ages 3-9. ?Your card will be charged when you make the reservation! As you leave Magic Kingdom for the evening, the magic continues! 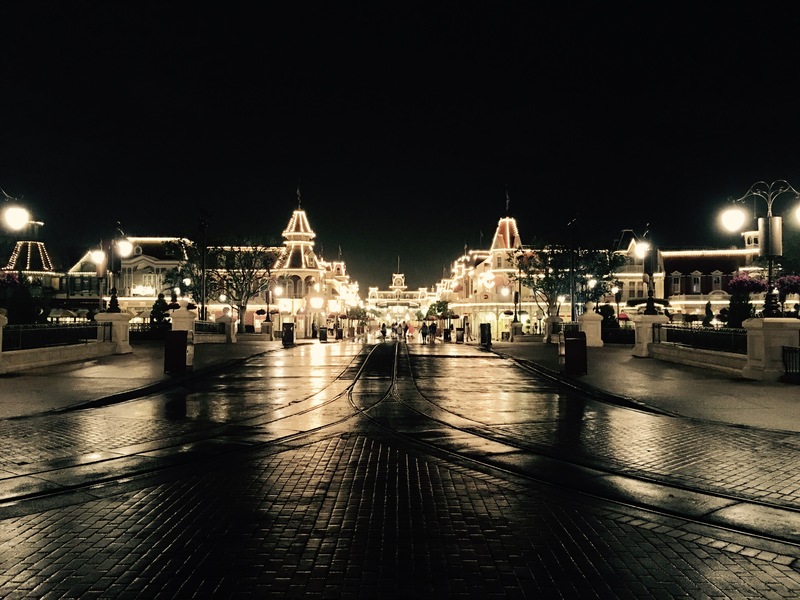 ?Take a moment and get one last picture of the train station and the Mickey ghost projected on the sidewalks! ?Until next year, I hope you enjoyed the most magical party of the season! Awaken Summer – Disney’s Newest Summer Attractions are now open! 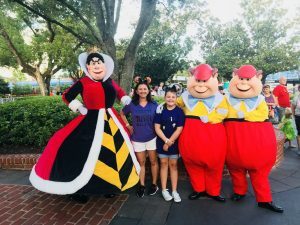 Disney World What’s New this Summer! 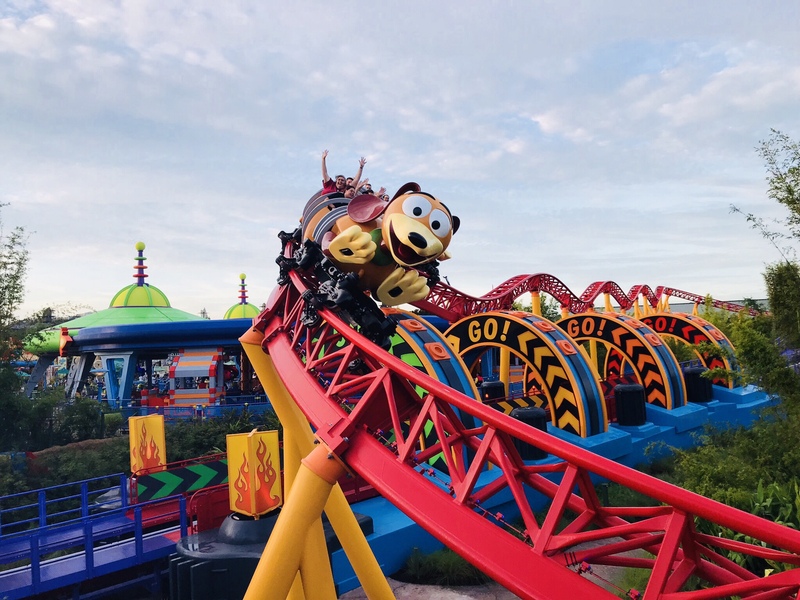 Disney’s widely shared Awaken Summer event begins Memorial Day weekend bringing guests a wide variety of new attractions and shows! ? 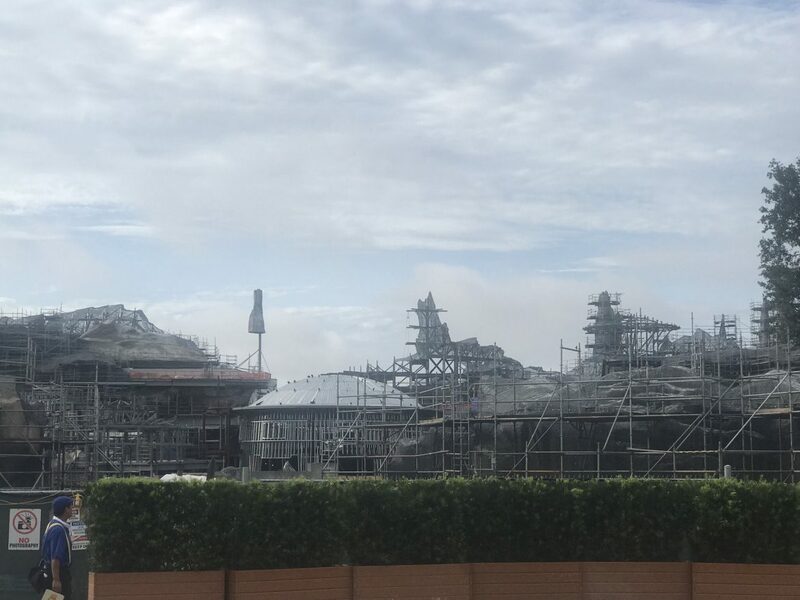 Its an exciting time to visit Disney World! We can’t wait to experience Disney World what’s new this summer! ?We’ll be sharing each of these attractions and shows as they open, with pictures, live videos and more! Head on over to my YouTube channel to see the live videos as I post them! The Show has arrived! ?View the video here! 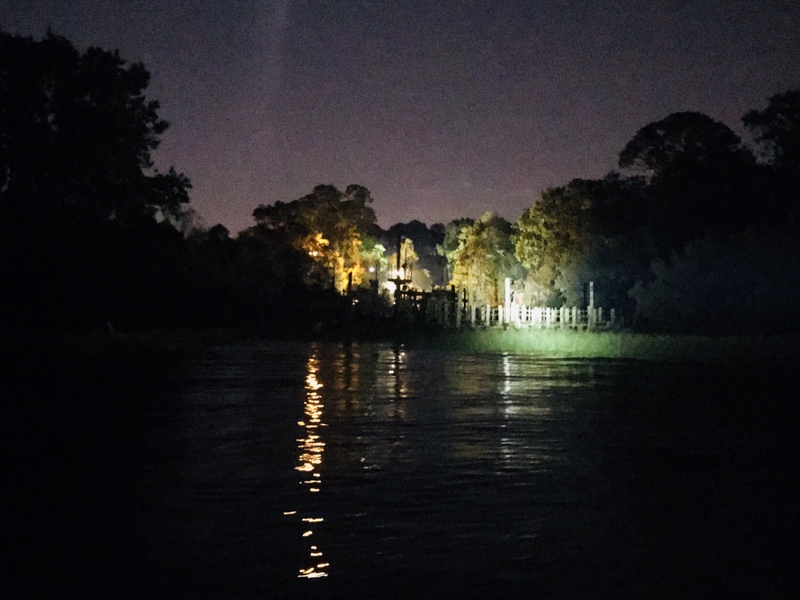 Kilimanjaro Safaris offers new nighttime safaris. Toy Story Mania’s third track opens helping to shorten wait times at this popular attraction. 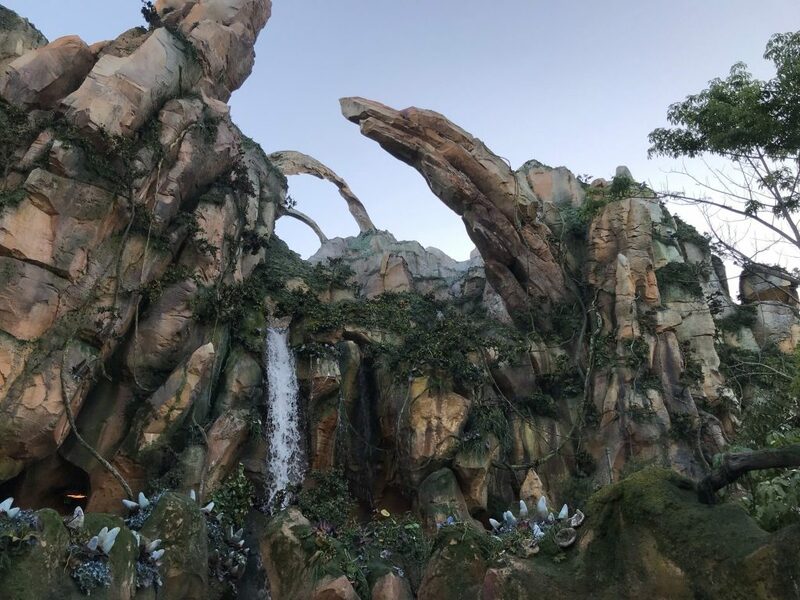 Jungle Book: Alive with Magic debuts. ?A water show that retells the tale of Baloo & Mowgli happens every night on Discovery River. 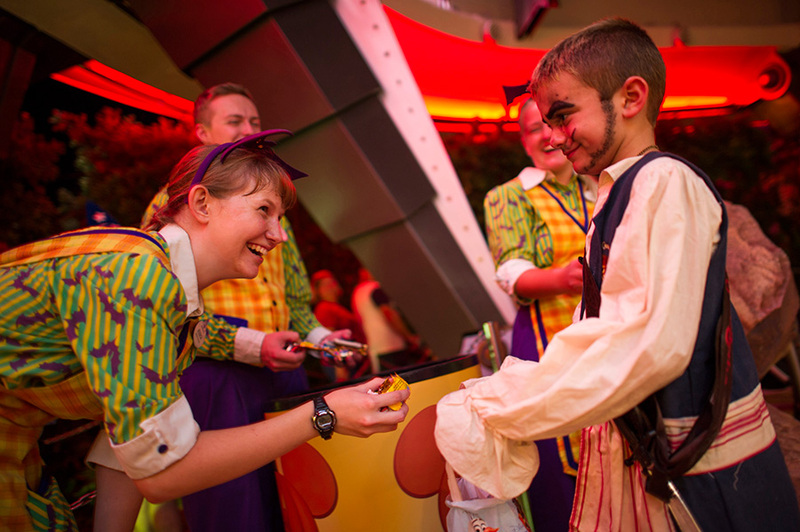 Mickey’s Royal Friendship Faire debuted and was a hit! ?View the video here! Mickey’s Royal Friendship Faire, Magic Kingdoms new castle stage show premiers featuring loved Disney characters Tiana, Naveen, Louis, Rapunzel, Flynn Ryder, Olaf, Anna, Elsa and of course our favorite Mickey Mouse, plus many other great Disney friends! Soarin Around the World opens! ?See the new Soaring Video here! Frozen Ever After opens! ?The much anticipated attraction in Norway opens for all of the Frozen lovers! Royal Sommerhus, the new meet and greet area for Anna & Elsa opens in Norway. Princess Elena of Avalor will be greeting guests in Magic Kingdom. ?Date and exact location to be announced. Check back often for updates and follow along as we explore the excitement of what’s new?on all of our social media channels! 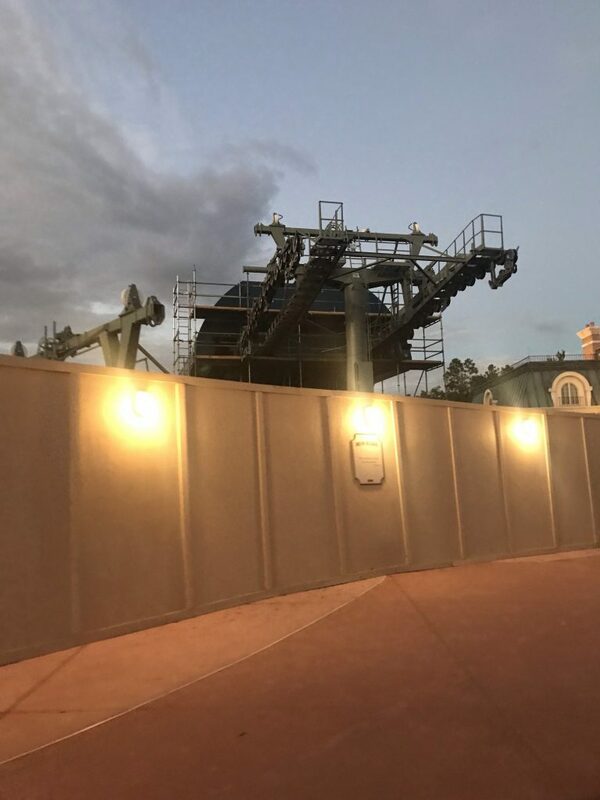 Disney After Hours, is it worth it? 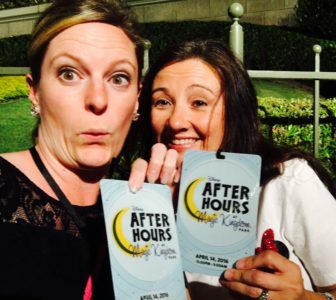 Recently Disney offered a newly ticketed event called Disney After Hours. ?It happens a select number of nights in April and May, with very limited ticket sales. ?Myself along with my great Disney pal Samantha were lucky enough to attend the new event on it’s first night. 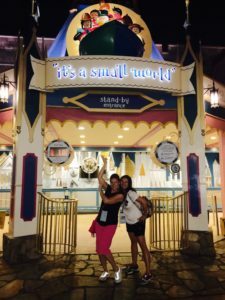 We can not even begin to rave enough about the fun we had at Disney After Hours! 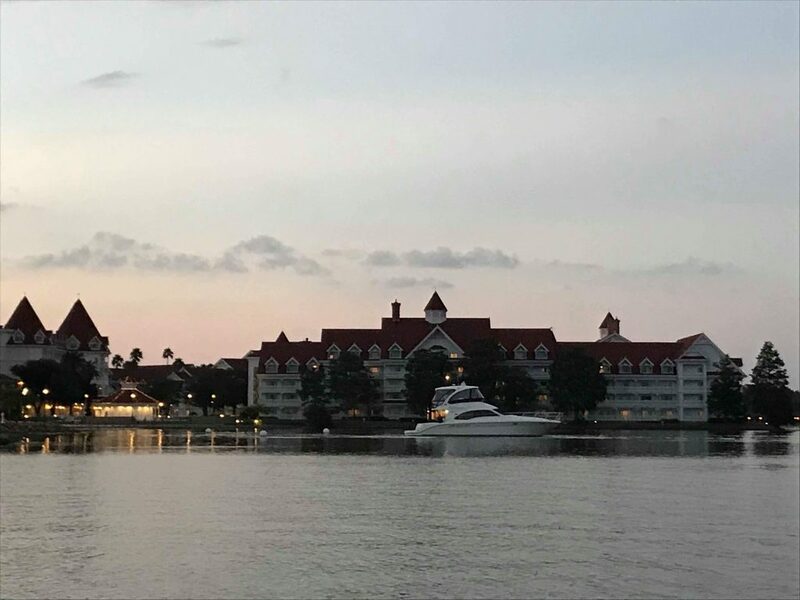 ?If you desire to have Magic Kingdom all to yourself, with the ability to walk on all of your favorite and most popular attractions, along with endless Mickey ice cream bars, this is the ticket for you! So, is Disney After Hours worth it? ? Time: ?The event begins at park close, however you can enter Magic Kingdom as early at 7 pm. 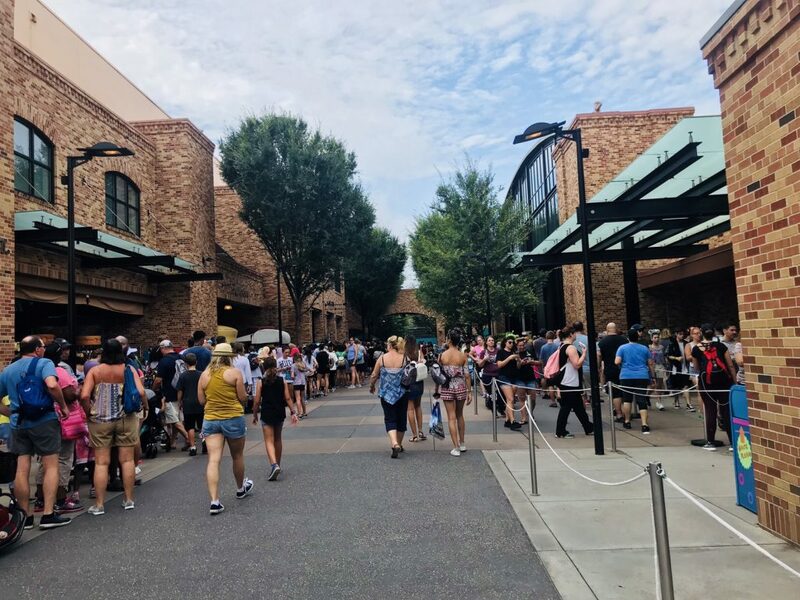 ?Magic Kingdom closes to Disney After Hours ticket holders up to 3 hours after park close. *Endless coke products in a bottle, also sold from the ice cream cart. *Access to literally walk on each and every ride! ?It is amazing! In other words, just about EVERYTHING! When we began our evening of Disney After Hours, we thought, lets see if we can ride everything. ?Within 15 minutes or so, it was clear that we could have ridden everything and maybe everything multiple times. ?So rather than just trying to ride it all, we decided to ride our favorites like Seven Dwarfs Mine Train repeatedly. ?Because really, why not! 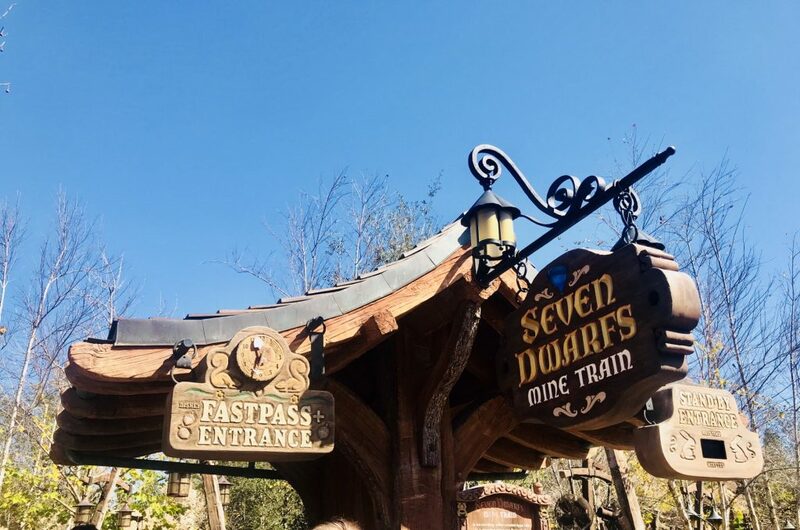 ?As you know, 7 Dwarfs can be darn near impossible to get on without a FastPass or 90 minute wait, so to ride it repeatedly WITHOUT waiting at all!!! made it all that much more fun! ?I can now tell you without a doubt that the best place to ride this attraction is in the VERY back! ?I know this because I rode it everywhere! ?That’s how UNcrowded?it was! 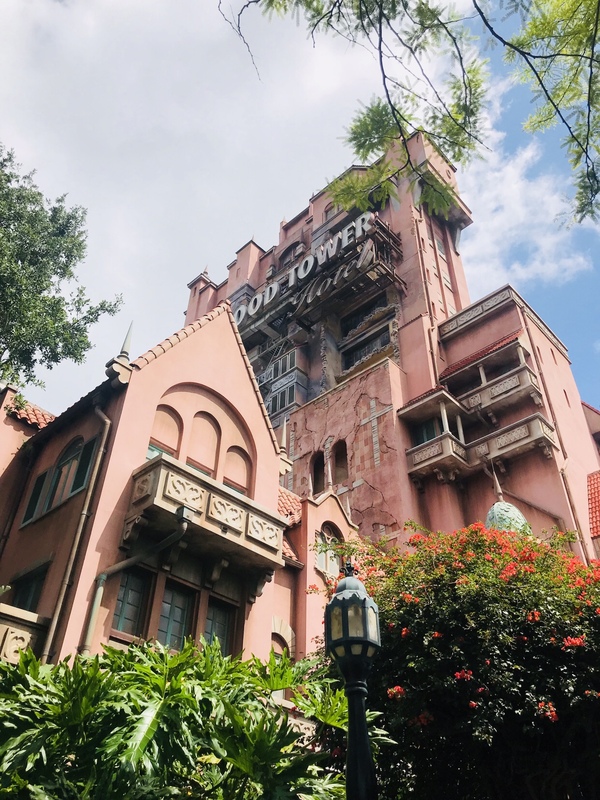 Along with endless walk on access to all of your favorite Magic Kingdom attractions you can have as many Mickey bars and sodas/water as you’d like! ?If you add up the cost of one ice cream and a soda, you’re looking at about $7.25, do that 3 or so times and you’ve easily made up the difference in a regular day’s park ticket cost vs the Disney After Hours cost. ?In my opinion, this is a ticket worth having! 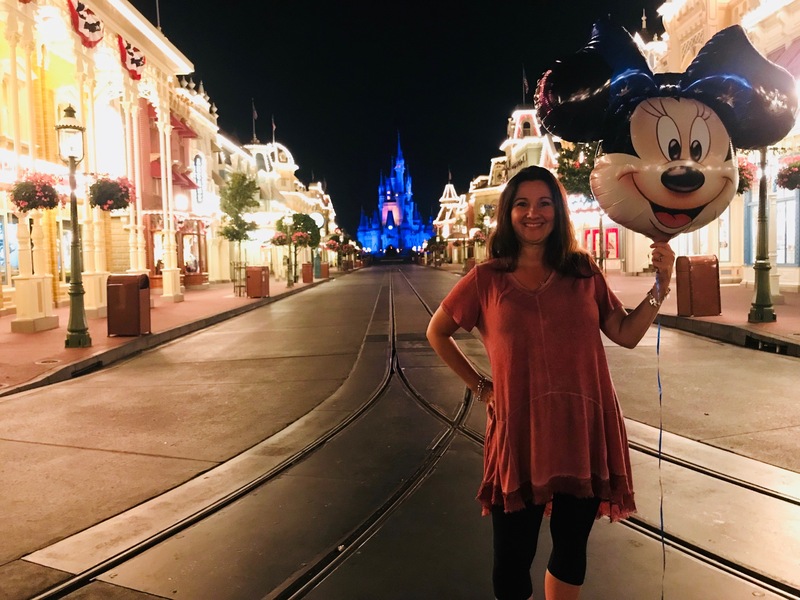 After you’ve enjoyed all of the walk on attractions your heart desires, and all of the Mickey bars your tummy can handle, then you can walk over to Cinderella’s Castle or Main Street and enjoy all of what Main Street has to offer. ?It is truly beautiful and serene and really somewhat peaceful when the park is empty! ?This honestly was my favorite part! ?The attractions are fabulous of course, but enjoying Magic Kingdom all to myself was truly magical. ?I honestly can’t even describe it! ?And then to make it even more magical, Disney magic happened! ?The music came on, the castle lit up and we had our own private little castle projection show! ?Disney Magic at it’s finest! Starbucks stop, because I am way to old to stay out until 2 am after I’ve worked all day! Found a spot to watch Celebrate the Magic and Wishes, two shows I could watch over and over again. Visited Rapunzel and Cinderella. ?We waited a short 10 minutes to see them. 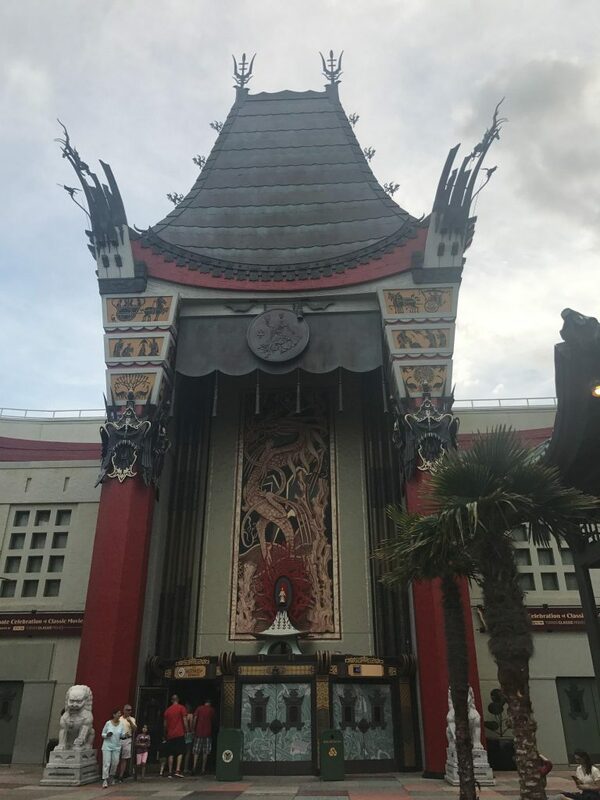 We walked right onto this ride, rode the ride with only one other car filled and then we were asked by the attendant if we would like to just stay on and go again! ?WHAT? ?This does NOT happen at Magic Kingdom! EVER!!! 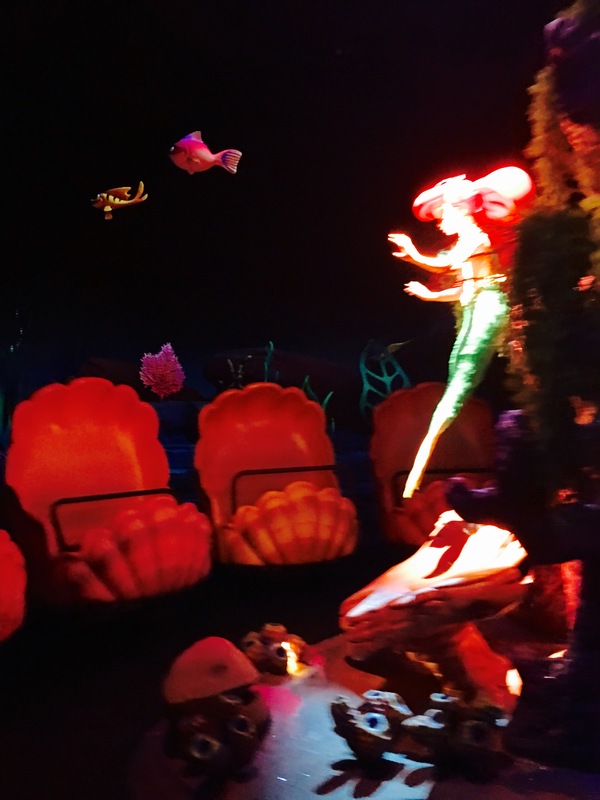 At this point, the park is still open so we decided to meet Ariel. ? (Ariel is not available after hours) No wait to meet Ariel either. ?Pretty much everyone leaves the park after Wishes or the last Electrical Parade, so you are able to do some attractions with a short wait time then. ?At this point, Seven Dwarfs still had a 30 minute wait. ?Short for Seven Dwarfs! all by ourselves…. I mean, seriously, it was EMPTY! We got off of Under the Sea about the time Magic Kingdom closed. ?From here we headed to Seven Dwarfs Mine Train. ?It’s what we had been waiting for and the line was non-existent! ?It was really quite confusing in an I just can’t believe this kinda way! This is our 7 Dwarfs pic… you’ll just have to trust me on this one. ?We rode twice, 2 times in a row. ?We didn’t even leave the main area, no walking the que the second time. ?Just right back on the ride. ?The attendant says, “pick anywhere, it’s up to you”. ?That never happens at Disney either! ?We choose the back and it is now official… the back is the BEST place to ride! ?It was amazing! ?A completely different ride than anywhere else in the car! From there we headed for our first of many Mickey ice cream bars. ?Well, Samantha did anyway. ?No ice cream for this poor girl! ?We sat, she ate, we broadcast live on Facebook, we sat longer. ?Remember we’re too old to be out this late, and then we just sat some more, in awe of the fact that Fantasyland was empty! ?EMPTY! We forgot the on-board selfie, so we opted for this one… hum sorry for the bad angle. After Peter we walked freely, without dodging people or small children, or strollers or any of the endless things that makes it hard to cross the path from Peter Pan’s Flight to It’s A Small World and again, walked right on board… right on! ?The longest part of the line, was just walking the que, which is actually REALLY long when you’re walking it and not waiting in it! The selfie was terrible, so we went with this picture. ?A Cast Member took it for us. ?And to get us and the sign in, she walked clear across to Peter Pan and just snapped the shot! ?Without anyone else in the way or waiting for our picture to be taken! ?It’s just me, Samantha and the Cast Member! ?I’m still overjoyed by this! 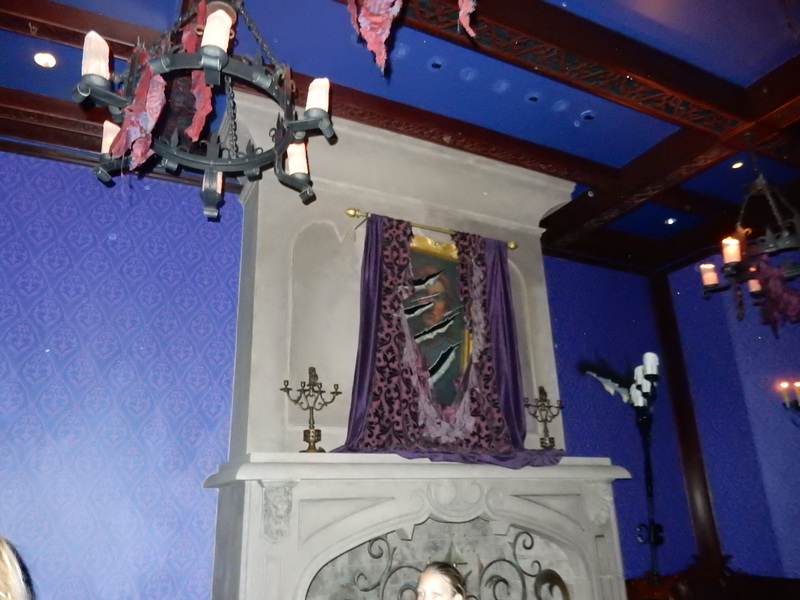 It’s too dark inside for a doom buggy picture, however I supposed we could have used the flash. ?Typically a no, no… but NO ONE was there! Unfortunately, it started to rain a bit at this point. ?Not hard, it was tolerable with a poncho, so we headed over to Big Thunder Mountain. ?No picture here because by the time we got there it was really raining. ?We walked on the attraction, picked our own seat, all which is feeling normal at this point, (lines and being told what car to get on will never feel the same again) and then off we went! ?Big Thunder in the rain, not so great. ?Nothing like rain drops in your eyeballs and you flailing around on the ride! ?So we only rode once and then headed to Main Street! We were full of laughs and just enjoying the evening, but no longer felt like we had to ride everything! ?But you could, you could for sure if you wanted too. Cinderella’s Castle and the Partners statue, with no one else around…. we were dying! 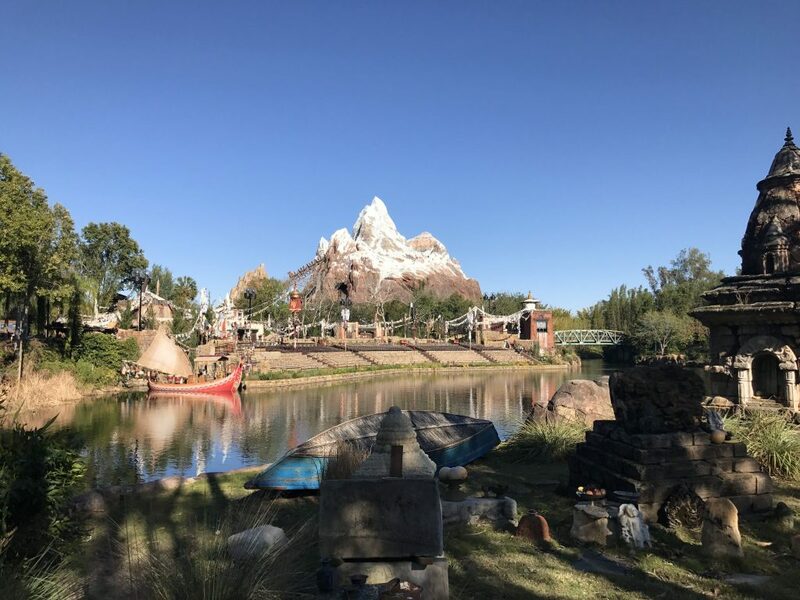 I have enjoyed this view before with an early morning, before the park opens, breakfast reservation. ?It is a gorgeous view then, but it is absolutely spectacular at night! We stood there in awe, for 30-45 minutes doing nothing but enjoying and taking in an almost empty Magic Kingdom. ?It was beautiful! Every once in awhile, some Disney magic would pop up. ?Like this double Decker bus that drove up and down Main Street giving guests rides from Cinderella’s Castle to the train station. ?It was never full, there was never a line to wait to get on. As we walked down Main Street just taking it all in, we stopped and talked to the Cast Members and met a special Disney Photopass Photographer. ?I’m unsure his name, but hope someone will read this and know! ?He took the most fun photos, all while saying nothing! ?He is a mime! ?Nothing but gestures and whistling and this was the result! The entire night was nothing but Magical! 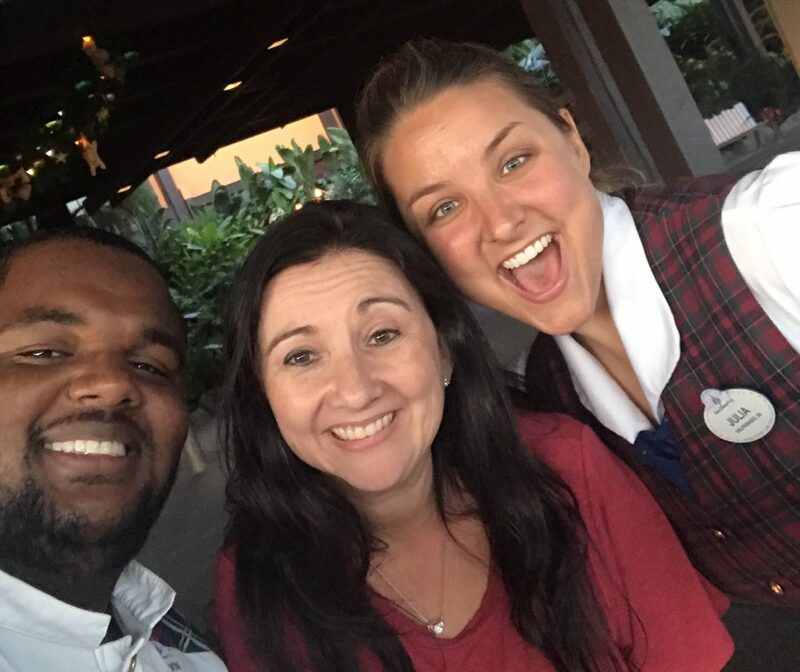 ?A special extra kind of Disney magic was in the air at Disney After Hours! Absolutely, without a doubt, ?YES! 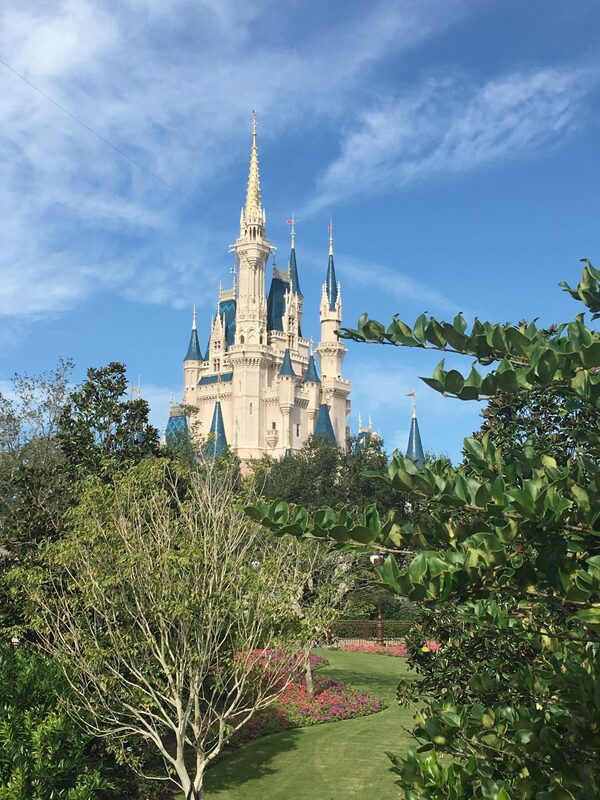 What to Pack In Your Disney World Bag! 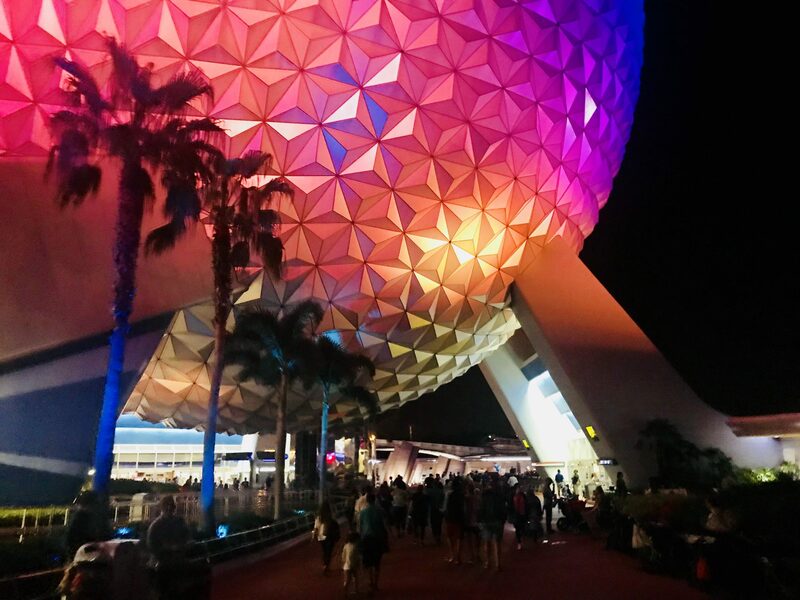 What to Pack in Your Disney World Park Bag! Being prepared for a long day at the Disney Parks is a must! It will make your day more enjoyable and save you some money, or at least save your money to spend on endless souvenirs! ?In my opinion, a backpack works best for a few reasons. First, the bag tends to get a bit heavy after all of the necessities are in it. A backpack seems to be the easiest to carry all day, rather than a bag that is only carried on one shoulder. ?Second, a backpack zips up tight so that you don’t have to worry about its contents falling out when you set it down at rides and shows. Sunglasses – put them in your bag the night before. ?It won’t be sunny in the morning when you leave bright and early. ?You don’t want to forget them! Lip Balm! ?– I can’t live without mine! ?I have a favorite a good friend of mine manufacturers and sells on Etsy! ?Inquire for more info! I seriously LOVE this stuff! Water bottle –?I prefer an insulated one. ?You can refill them up for free in the parks! 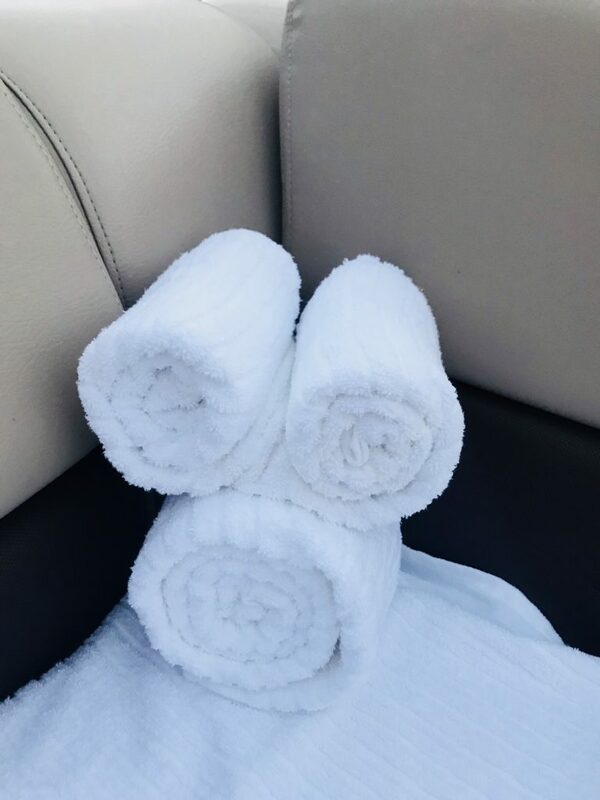 Towel – great for a seat saver/wiper, sun blocker and blanket! Tissues/wipes! – I like wet wipes! For those sticky moments after you eat Mouse ear ice cream! Pins! and Lanyards?– We love to trade pins! I’ll post about how to do that less expensively soon! Jacket– it does actually get cool in Florida! ?Maybe not in July, but at other times of the year! My mom always says it’s better to have it and not need it, than to need it and not have it! ?This can be used to save seats and provide shade as well! Snacks! ?-Seriously you will not want to buy every snack you consume in the parks! Picture this, your standing in line, your hot, overly tired kid is whining and hungry! You’re half way to the ride… To far in to go out, but not close enough to survive the impending temper tantrum! Give that kid, and yourself!! !, a snack! Ziploc Bags – a must! ?This is the perfect place to store left over snacks/meals or anything else you might want to contain! External Charging Device for your phone -?Soon you will be able to purchase a Love of the Mouse one here! ?Inquire to learn more! ?After all, who doesn’t love mouse ears all over everything! Poncho – in case of rain, but also for the water rides you really want to ride, but don’t want to get wet. ?You can buy these at the dollar store and save big! ?They are around $20 each in the parks. Spray Bottle Fans – you can buy these in the parks, but it’s much cheaper to bring your own! Cooling towels – It’s hot, really hot! ?Get them wet, shake them out and miraculously they get cool! Autograph Book and Pens – you can buy these in the park, but again it’s much cheaper to bring your own! ?I always bring extra sharpies (my pen preference) to share. ?There is always someone in line scrambling for a pen. ?Yes, it’s perfectly ok to just loan yours, but it’s even better to pixie dust that pen so they don’t have to scramble again the next time! ?You can buy a large set at your local craft store and use a 40% coupon. Pennies?and a Penny Container?- there are many pressed penny and quarter machines in all of the parks. ?This is a great and fun souvenir without having to spend a ton of money! ?I pressed my first penny in college standing on top of the Twin Towers in NYC the summer before they fell. ?Needless to say, this is now an awesome token! MagicBands – put them in your bag the night before so you don’t forget them! Hat?– you’ll need this, until you replace it with mouse ears that is! Selfie Sticks – As of June 30, 2015, Disney will no longer allow selfie sticks to enter any of the parks. 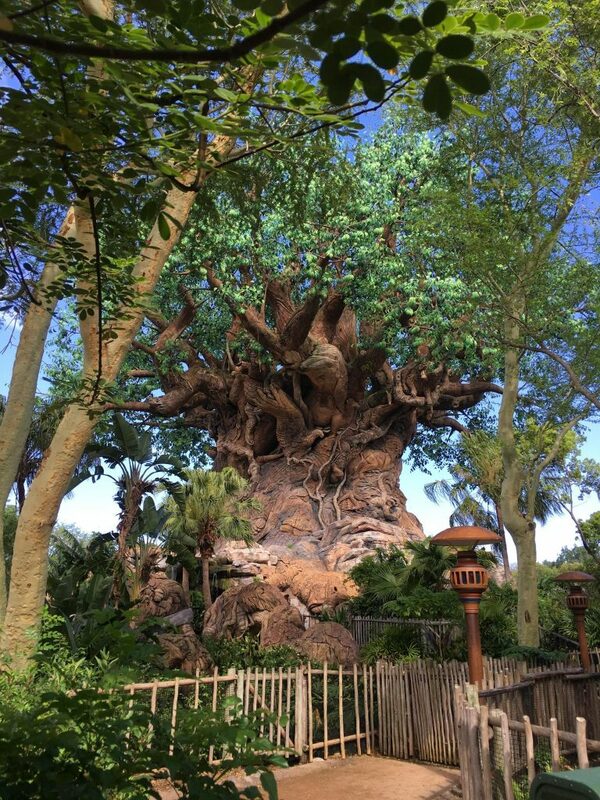 Hope this helps you pack the perfect Disney World vacation bag! Make sure you like us on facebook at “Love of the Mouse”! 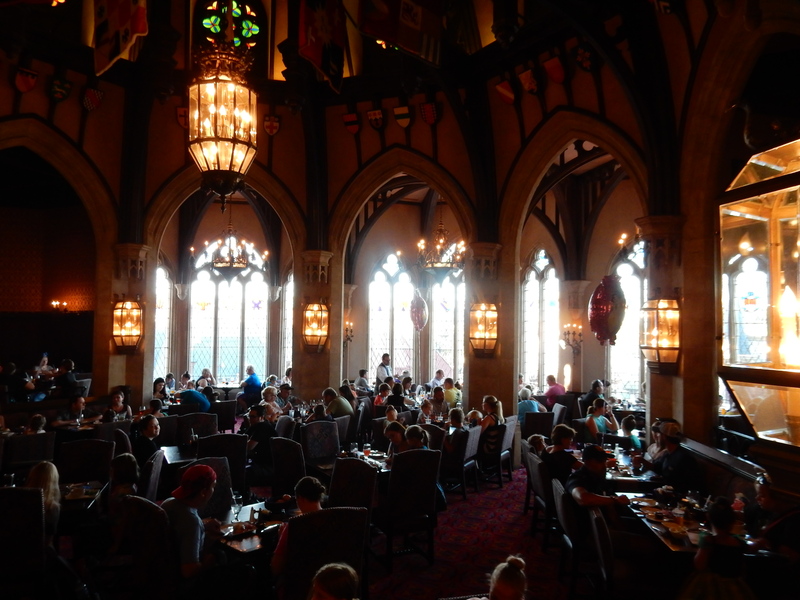 The dining options at Magic Kingdom are nearly endless! ?With so many choices where do you start? ?Look no further than right here! 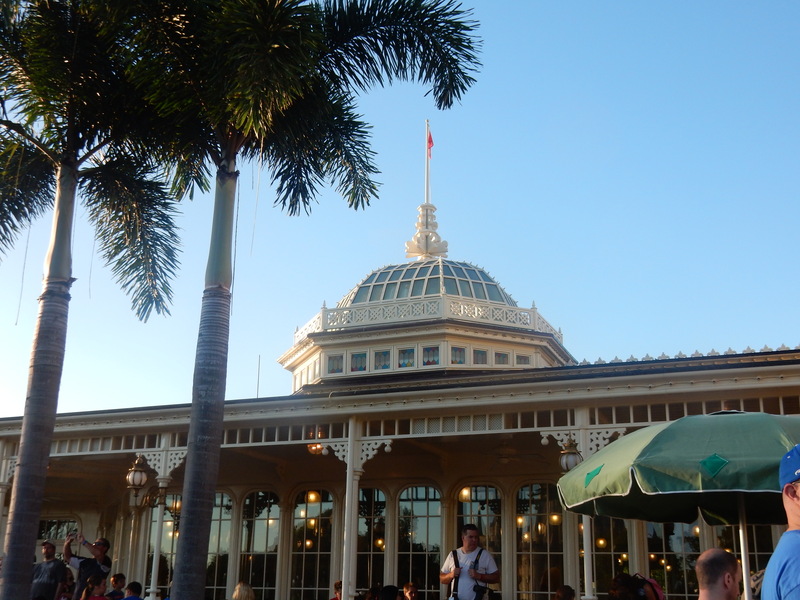 ?While I have visited a great majority of the dining options in Magic Kingdom, I have not visited them all. ?I will do my best to give you insights into each place so that you can choose what is best for you and your family! ?Remember, reservations are a must for many table service restaurants, especially the most popular ones. ?You can read my previous post here “Making Reservations” to learn when and how to a make your table service reservations. Be Our Guest – is located in Fantasyland. ?It is one of Magic Kingdoms newest restaurants, and one of the harder reservations to get. ?You can not, at the current time, walk up and walk right in (unless you just happen to get lucky, so don’t count on it!). 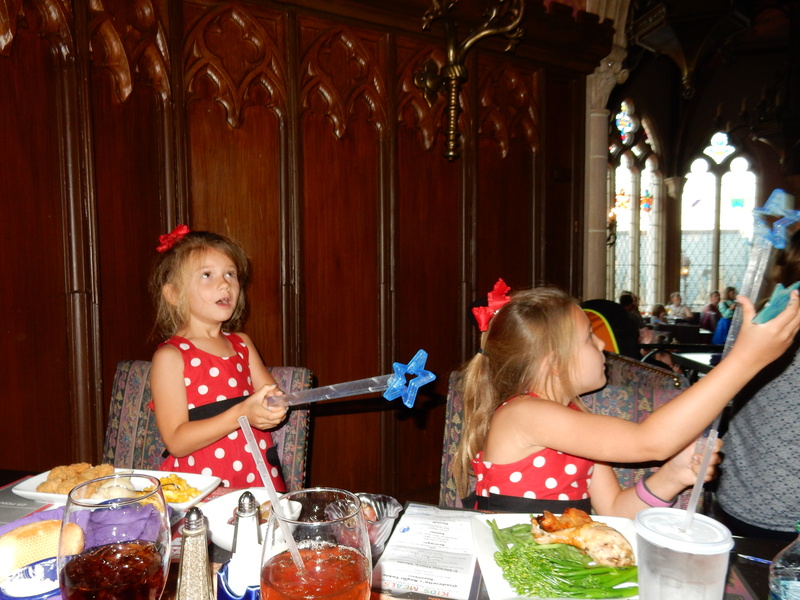 ?It is the home of Belle’s Castle and boasts 3 enchanted dining rooms, each with their own special Disney effects. ?You order via kiosk and are given a rose to receive your meal, which is?delivered to your table for breakfast and lunch, table service at dinner. Rose given at time of ordering. Allergy notes: ?We ate here for lunch and were impressed with not only the decor, but also with the impressive service from staff insuring our food safety. ?Even though you typically order from a kiosk, a chef happily greeted us at the kiosk and entered our order, then took the order to the back himself and prepared it. 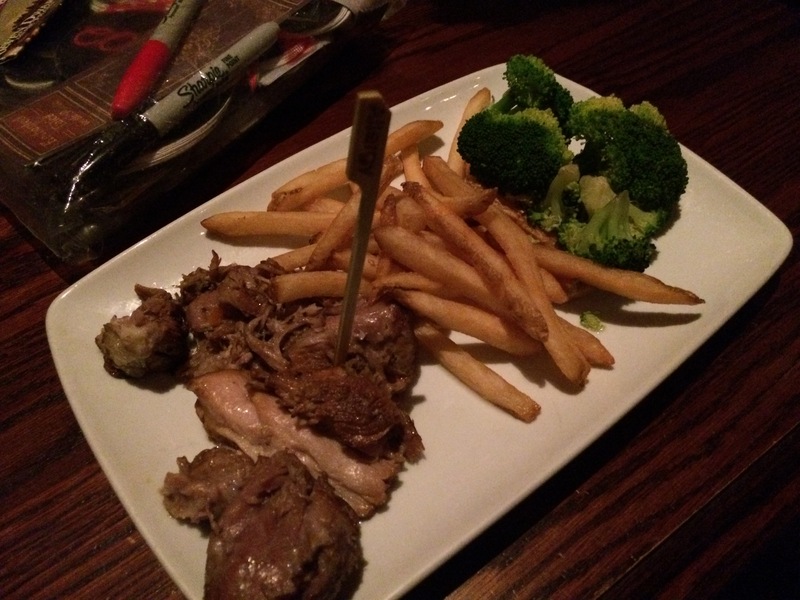 ?It was delivered to our table, covered in order to not contaminate our food. ?The variety of choices was not overly large, however what was available was tasty and well prepared. ?BOG did have separate fryers so I could enjoy gf fries! ?Always a treat! ?They did not have any gf/dairy free dessert options. 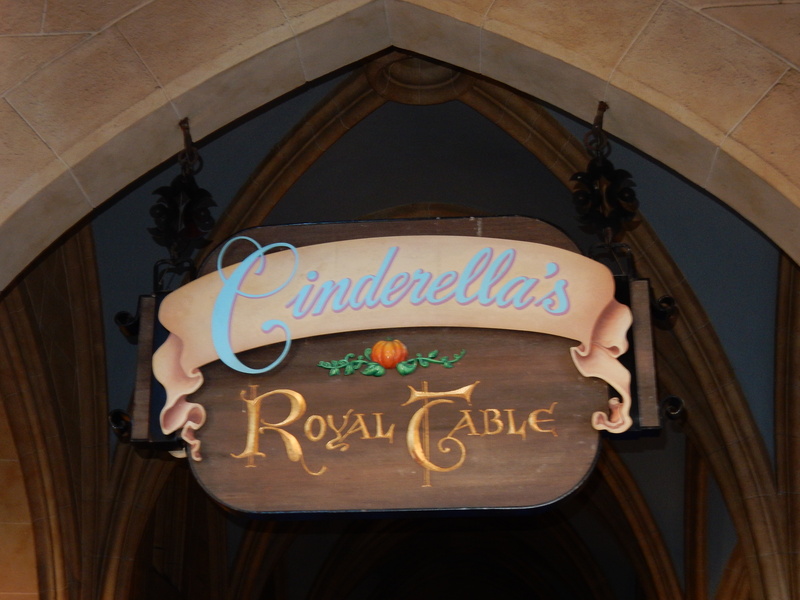 Cinderella’s Royal Table – located in Cinderella’s Castle. This restaurant is a must, a least once, if you have any love of princesses living in your house, or if you’re dying to get inside Cinderellas Castle! ?This is by far the hardest reservation to get inside Magic Kingdom! ?So if you want it, you’ll need to be up bright and early on 180 days prior and hope that the magic is with you! ?If you don’t get it at first, don’t give up! ?There are ways to get it, hopefully, if you’re persistent. ?I did not get it my first try, but was happy to finally get it booked after weeks of trying! 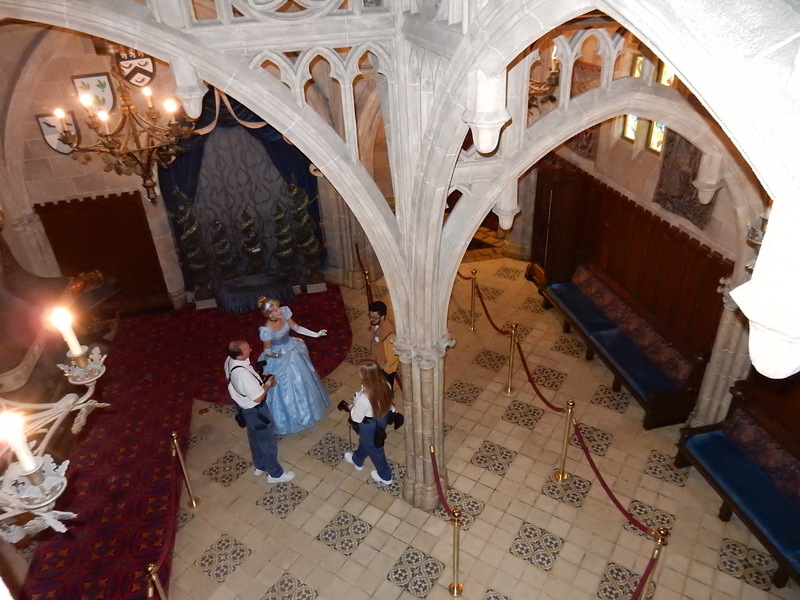 View looking down onto the main entrance area where you get your picture taken with Cinderella. This reservation starts in the bottom level of the castle with a picture of Cinderella and your family! ?These pictures are printed and delivered to your table and are not part of the photopass package. 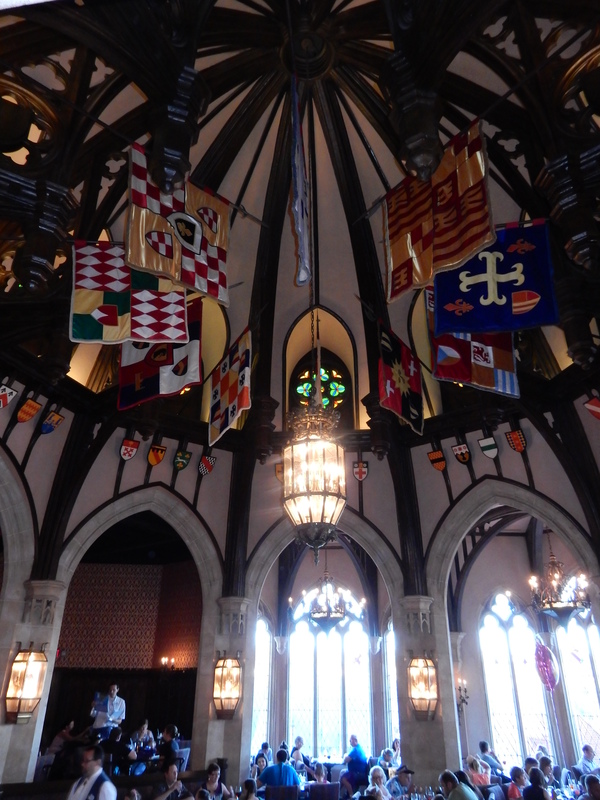 ?The room is grand like a castle, make sure to look up for Gus and Jaq in the rafters. 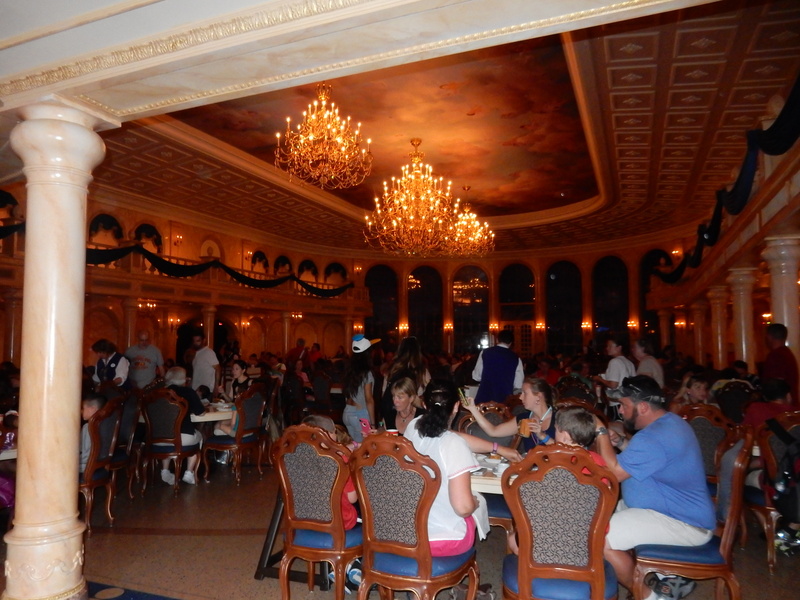 After meeting Cinderella you are escorted up the main staircase and seated in the dining area. ?The stained glass windows look out the back of the castle and onto Fantasyland. ?The Castle was recently refurbished and restaurant closed for a bit in January 2015. ?I’m not sure if anything was truly changed or if it was just scheduled maintenance. Guests are given wishing stars and wands to participate in a little magic ceremony as the meal begins and the characters are introduced. ?We saw Snow White, Jasmine, Ariel, Aurora and of course Cinderella while we were there. ?The characters can change, so if you are looking for someone particular this may not be the best route to ensure seeing them. The menu is 3 course, and patrons choose one item from each course, with only a few choices to choose from. ?The princesses make their way around the dining room visiting each table individually. ?You will have time for pictures, an autograph or two, but not much time for conversation. ?My girls truly enjoyed this experience and although the pictures are not great, due to all of the tables and heads in the background, we still have them none the less. I would suggest asking to be sat in the main part of the dining room near the windows if possible (not around the perimeter) but there are no guarantees for seating. ?My philosophy is it never hurts to ask, and Disney always does their best to make your time there extra special. There are a few new packages avaliable within your reservation, “Her Royal Highness” for little princesses and “Glass Slipper Engagment”. 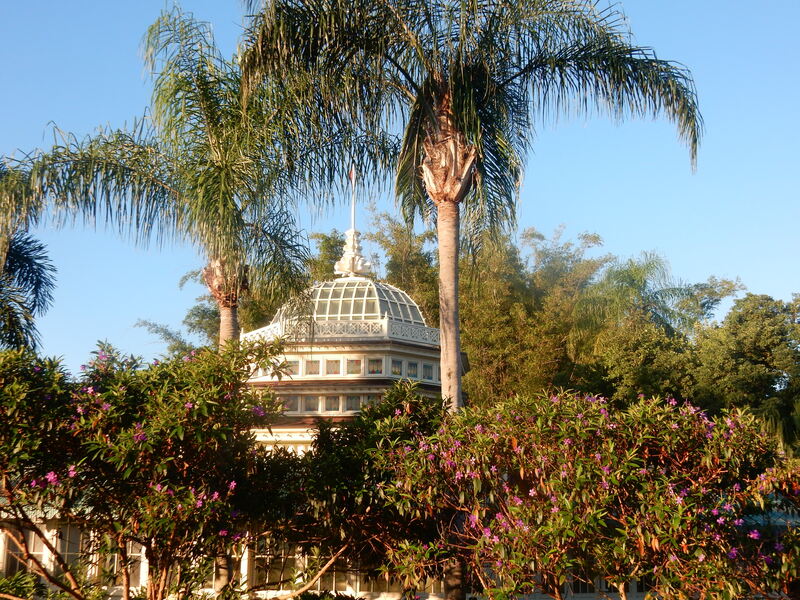 Details of these packages can be found by clicking on the link?of My Disney Experience. Allergy friendliness: ?I had a good experience here as well, in terms of safeness of my food. ?A chef came to the table and was able to prepare a meal that met my dietry requirements. ?The choices again were very limited, and not terribly exciting but they weren’t bland and boring either. ?Probably my biggest disappointment was that the only offerings they had for the dessert portion of the menu was fresh fruit. ?It was good, but when you know there are better “desserty” options within the park, it was disappointing. Amazing dessert! – Not allergy friendly! I didn’t take any pictures of my allergy meal. ?I apparently didn’t find it all that exciting. Overall, our experience here was fantastic and worth the money simply for the atmosphere and the coolness of getting to go in the Castle! 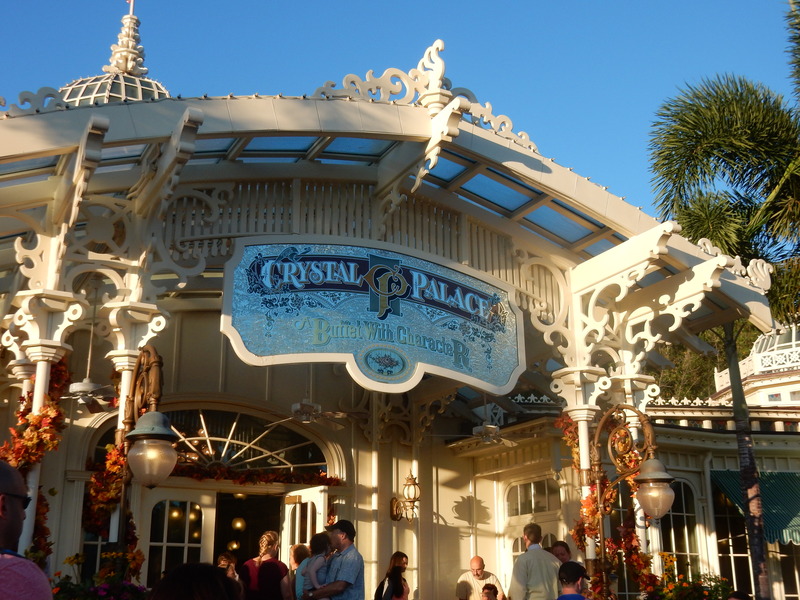 Crystal Palace – Located right off of main street to the left of the castle. ?We visited this restaurant as our ploy to get into Magic Kingdom before the crowds, so we could get the Castle picture without anyone in it. ?See that post by clicking (here!) ?This is a character meal which features Winnie the Pooh and Friends. ?All meals are buffet style at breakfast, lunch and dinner. ?The atmosphere is light and airy, appearing like a green house. ?The staff was uber friendly and helpful! ?I would recommend this if your dying to visit with Pooh and his friends, or as a way to get into the park before hours. ?The food was good, and atmosphere nice, but to me it doesn’t demand my return unless I was looking for the above mentioned items. Allergy friendliness: ?Buffets can be hard on those of us with allergies! ?You just never know what’s lurking in something that looks or typically is safe. ?It is always best to ask for guidance. 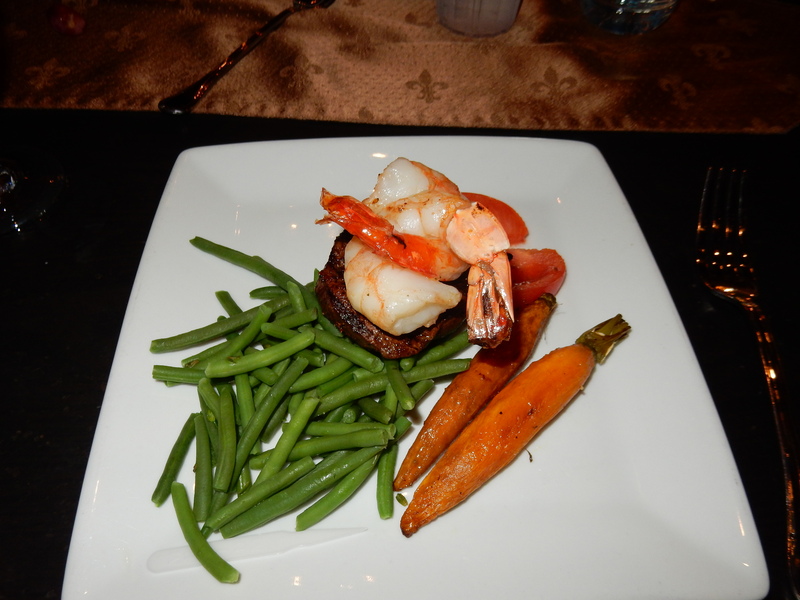 ?On my visit, a chef accompanied me through the buffet line and listed ingredients and pointed to what was safe. ?If there was something he was unsure of, he did not guess, and was quick to tell me he would rather double check than ruin my day! ?I so appreciate this kind of thing! ?It can be hard for people without food allergies to completely understand the repercussions of eating something your body doesn’t agree with. ?I have had many disappointments in this area, and witnessed and given my share of snarky comments. ?Yuck, no fun! ?Either way, those things never, not once, have happened at any Disney dining facility I have visited. ?IF anything, they are often overly cautious! ?Which is awesome! ?It’s one of the many, many reasons I LOVE Disney and continually return! There were gluten free Mickey Mouse waffles here, which my daughter was able to enjoy! ?I was so happy for her, because no kid should have to go without those on a Disney trip! ?I could not partake as they use rice flour as the wheat (gluten) flour substitute and I don’t tolerate rice well, but I was happy to see that Disney makes and incredible effort to keep up the fun for everyone! Again, the food is not extraordinary, but the effort of the staff was endless. ?And if you can get a safe and good meal, visit Pooh and Friends, and get your picture in front of the Castle minus the crowd (8 am breakfast reservation only) then I’d say it’s worth it! I have not eaten lunch or dinner here, but would imagine the food is about the same level of goodness. Liberty Tree Tavern – located in Liberty Square and serves up buffet and family style all American meals, complete with a turkey dinner! ?This is a table service location I have not visited. 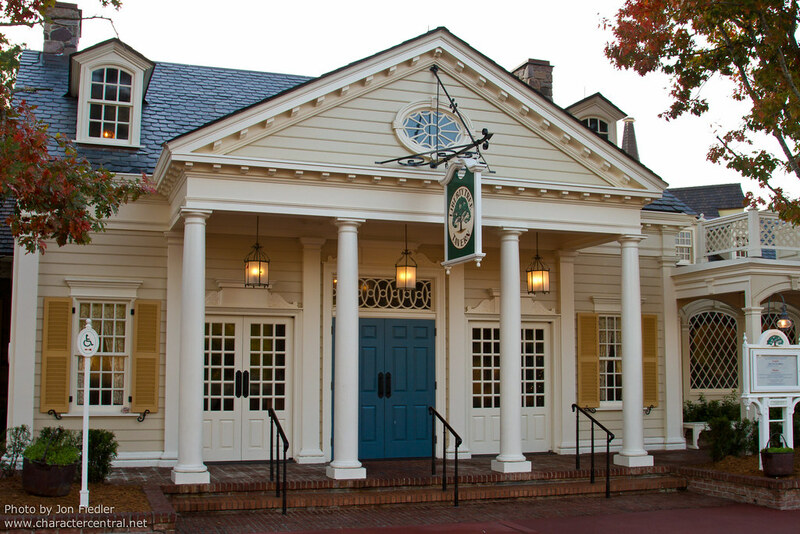 Liberty Tree Tavern will be closed for refurbishments from July 6, 2015 to November 20, 2015. Allergy friendliness: ?to be updated soon! 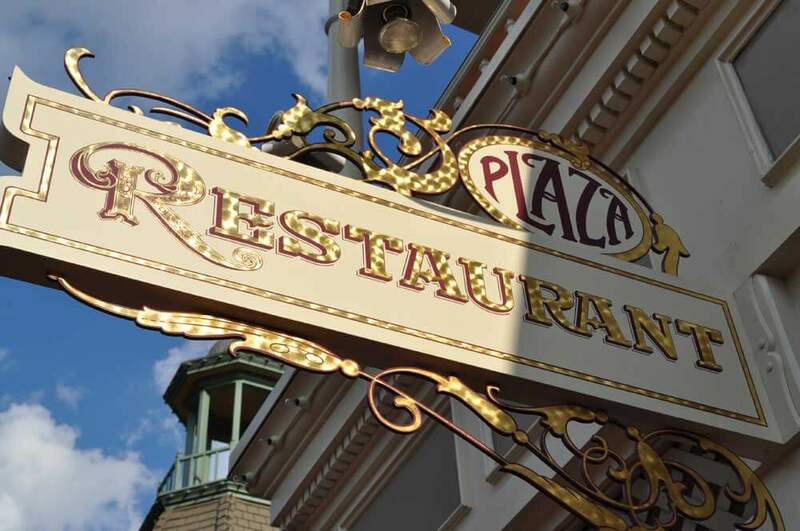 Plaza Restaurant – located on Main Street, USA. ?This table service restaurant serves up comfort food, complete with meatloaf and mashed potatoes, as well as sandwiches. ?They are open for lunch and dinner and reservations are accepted. ?This is another location I have not visited. Allergy?friendliness: to be updated soon! Tomorrowland Terrace Fireworks Dessert Party?– located in Tomorrowland at the Tomorrowland Terrace Restaurant. ?This location is a quick service restaurant for lunch and dinner from 11:00 am – 9:00 pm. ?It is then reopened for guests who hold a reservation of the Fireworks Dessert Party. ?It is recommend that guests check the daily schedule and to arrive for the party apx 60 minutes before the start of the fireworks show. ?This can be a very hard reservation to get, so please, if your dying to visit here, make your reservation at 180 day from your visit. Guests will enjoy and unobstructed view of Cinderella’s Castle, the fireworks and Tink making her nightly flight from the Castle. Guests will be seated and then invited to visit the dessert buffet. ?Often times people will stand and line up near the edge of the balcony, so if you want the best view, you may try to line up earlier rather than later. Allergy friendliness: I have not visited here, but am positive that with an advanced phone call they can accommodate your needs. ?Additionally, Babycakes NYC, which has several locations? (click link for locations) throughout Disney World will deliver their fabulous allergy friendly and vegan desserts. ?Seriously people, these are some of the VERY best treats I have eaten! 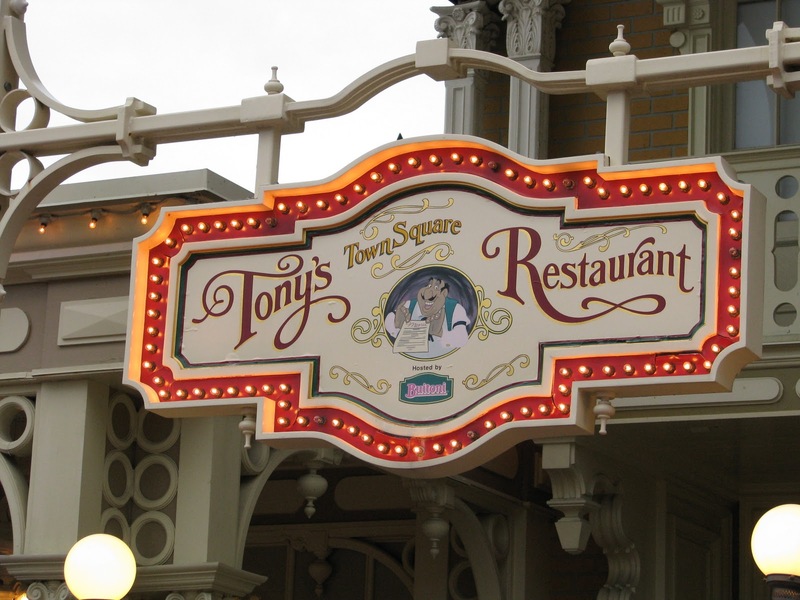 Tony’s Town Square Restaurant – located on Main Street USA and open for lunch and dinner. ?Tony’s features an Italian menu complete with old fashioned spaghetti and meatballs. ?This is a location I have not visited, but I am sure is yummy none the less. Allergy friendliness: ?I have not visited this location, but would guess that they have gluten free pasta options. ?It would be worth a phone call to find out before making reservations if you need special accommodations. ?More info coming soon. 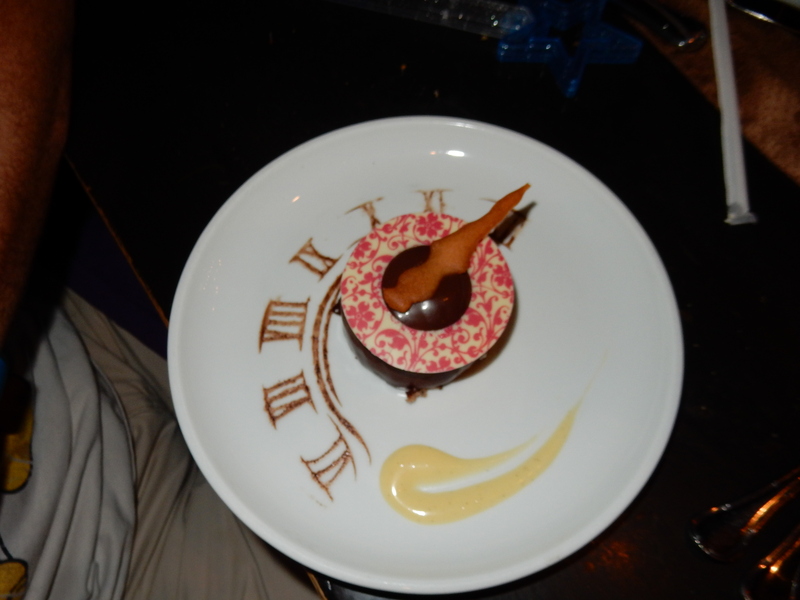 Wishes Fireworks Dessert Party – located in Tomorrowland at the Terrace Restaurant. ?I am not sure the difference between this fireworks dessert party and the Tomorrowland Terrace Fireworks Dessert party. ?However, I will get to the bottom of it! ?Check back soon! 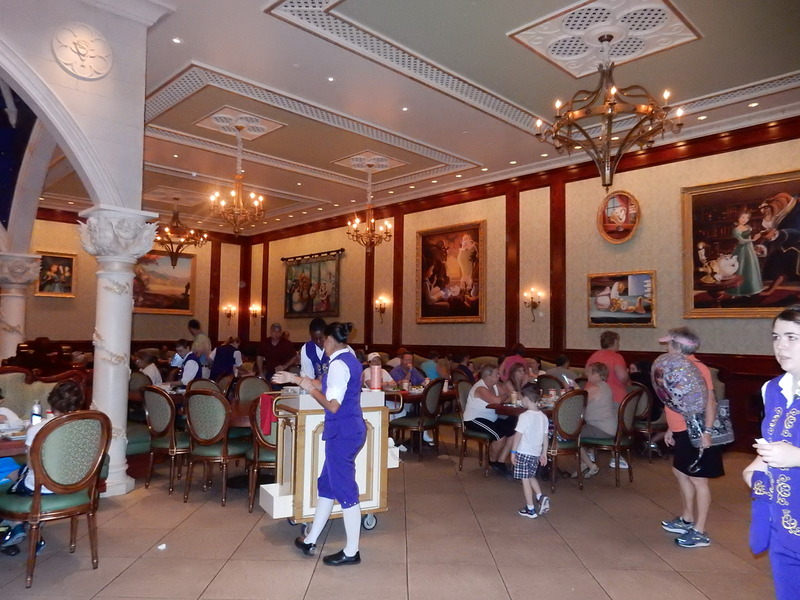 You’ve reached the end of the wonderful list of table service dining options at Magic Kingdom! ?I hope you’ve enjoyed my personal pictures and insights where I could share them. ?Keep checking back for updated info, as this page is always a work in progress. Quick service restaurants coming soon! Quick reference table coming soon! ?For those of you that don’t like to read! Not this picture! Keep reading! 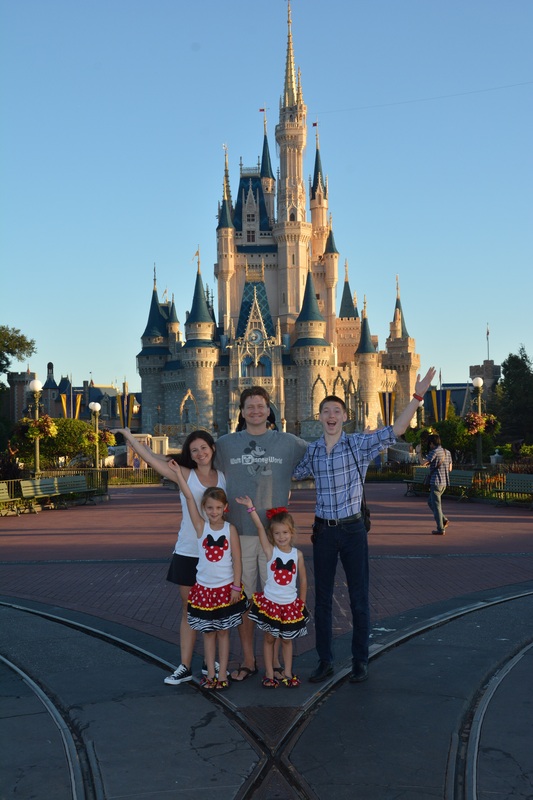 Let’s face it, Disney World is all about making memories and having a great time doing so! ?Along with making those memories, we take pictures along the way, so that we can look back and remember the great times we’ve had! ?Magic Kingdom has many great places to take pictures and make memories! ?Memories to last a life time, memories that we hope to grow up and share with our own children! We have all seen (a million times over) the pictures of families posted up on Main Street, with Cinderella’s Castle gleaming in the background. ?It’s almost says “I’ve arrived! ?We made it!” ?In that obligatory “we’ve made it picture”, it also shows the hundreds of other guests that have also, “made it” to the park that day! ?While there is nothing wrong with that, I can show you how to do it better! ?There is a way for you to have “THE” picture, minus all of the guests! ? (and you don’t need to know Photoshop!) So here we go! The key is to get into Magic Kingdom before?everyone else. ?In order to do this, you need to book a breakfast reservation before the park opens. ?Magic Kingdom’s opening time is different each day. ?Book your reservation on a day that the park opens at 9 am or later, and does not have Extra Magic Hours in the morning. ?This will reduce the crowds entering the park, to only people attending a breakfast reservation. ? (I will write another post about what the morning of breakfast looks like, and how they line you up to get in the park). Reservations can be made at 180 days prior to your arrival. ?You will need to book these then! 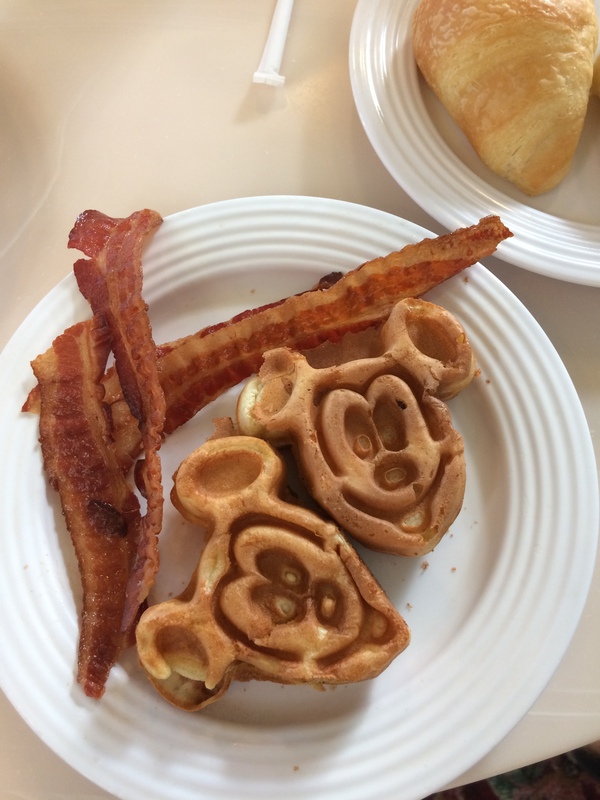 ?Each of these restaurants typically offer a character breakfast each morning and therefore will get you into the park BEFORE the crowd! Wa-la! ?You have your perfect “we’ve made it”, Magic Kingdom, Main Street, Cinderella’s Castle picture, minus the crowds! Side note: Notice in my picture, there is a person walking in the background. ?This was me being to timid to ask the photographer to wait for a clear shot. ?I didn’t want to?inconvenience?them or put them out! Don’t do this to?yourselves people! ?Wait for it! ?Get what you worked so hard for! ?The photographer doesn’t mind! ?They’re going to be there ALL day! Don’t forget to like LoveoftheMouse on fb!